A month since I turned my phone off, instantly feeling isolated and cut-off from everything at home, and boarded a flight to Buenos Aires. No more access to bicycle shops for last minute spares, or chemists that spoke English, no more time to plot potential cycling routes south from where I would land, no more time to plan anything. The spreadsheets, maps, conversations and planning become reality the moment my phone’s screen went blank. 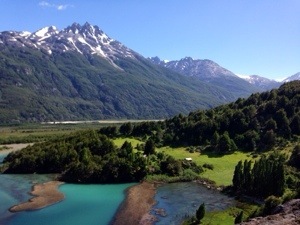 I cycled from Puerto Montt south through Chile to El Chalten in Argentina and then hiked the circuit of Torres del Paine. 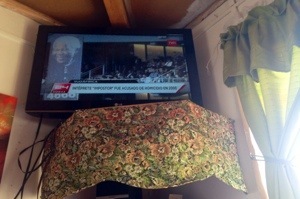 However, very little of the adventure went according to how it was planned from my ‘base camp’ in Cape Town – behind a computer screen in a first-world apartment a continent away. Fortunately, I wouldn’t need much of the medical kit and nor the bicycle spares. Things I thought could break didn’t. Those I thought wouldn’t break did. 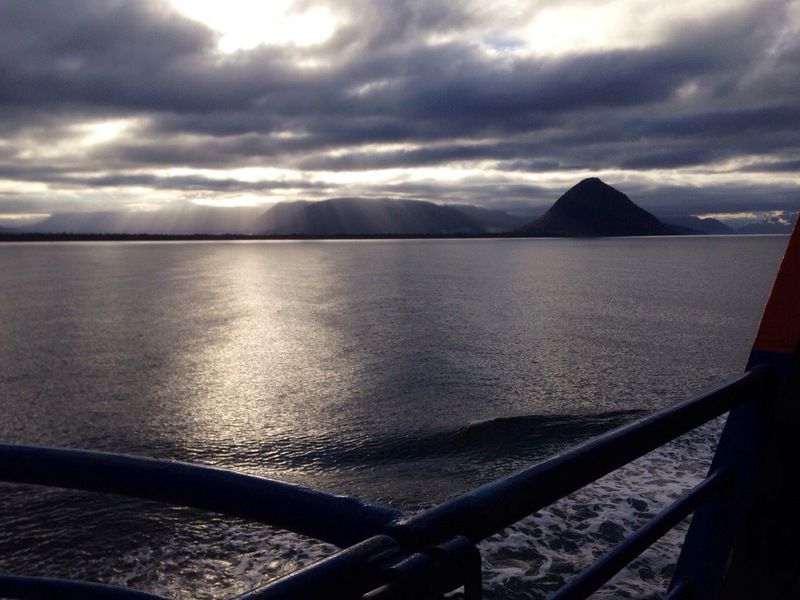 The route I’d take would be altered by ferry-crossings, winds and luck. Some days would be easier, some would be impossible. The weather would be as expected, but ‘7 degrees with rain’ when you’re 73km away from the next shelter and food is very different to ‘7 degrees with rain’ on an iPhone screen when you’re sipping an americano in Cape Town! But that’s what makes it an adventure. 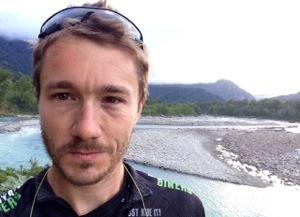 A month and a huge adventure later, I’ve crossed the Andes on a bicycle and on foot, explored glaciers, summited mountains, bivy’d next to rivers, bivy’d in the rain, bivy’d in the snow and under star-filled skies, found border crossing few knew existed, lost a few kilograms and toenails, learnt to predict the weather in Patagonia (cold with a very strong westerly wind, everyday), learnt more spanish, found help from absolute strangers when the unexpected did go wrong, met like-minded travelers from Korea, Canada, the US, the UK, Switzerland, Belgium, Slovakia, Argentina, Poland, Chile, Colombia, Mexico, Germany, France, South Africa, New Zealand, Brazil, The Netherlands, Israel, The Czech Republic, Spain and Russia, each on their own adventures at their own pace in their own way – some cycling, some walking, some using ships and ferries, some backpacking, some doing nothing at all – each with their own story to tell. In a few minutes, and a month later, I’ll step off this flight. This adventure will end. But that blank screen will light up and with the world at my fingertips once again from base camp, I’ll start planning the Next Big Adventure! 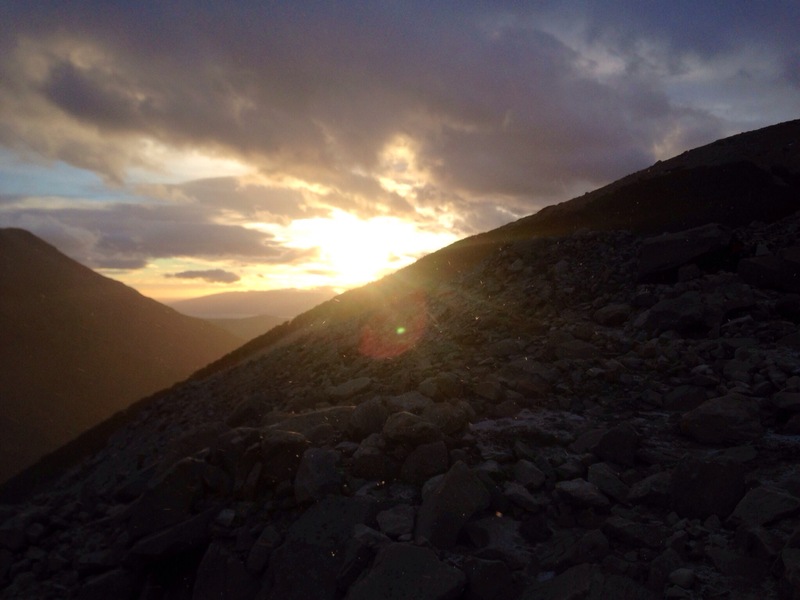 My alarm wakes me at 3:30am on 1 January 2014, only a couple hours after I zipped into my bivy bag. I lie quietly and listen; nothing. It isn’t raining and the wind has stopped, perfect! Next I find my headlight and cautiously peel myself out of my waterproof shelter. I sit up and look around. I’m camped in a small forest and there is snow falling softly across the beam of my headlight, but looking up I can see a few stars between the trees. There should be a sunrise and I make the tough decision to get out of my sleeping bag. I have 2 sets of clothes; hiking clothes and ‘clean’ clothes. It’s near the end of the trip so I can no longer tell the difference between the clean ones and the hiking-in ones. Its also well below zero degrees – I’ll wear all of them. 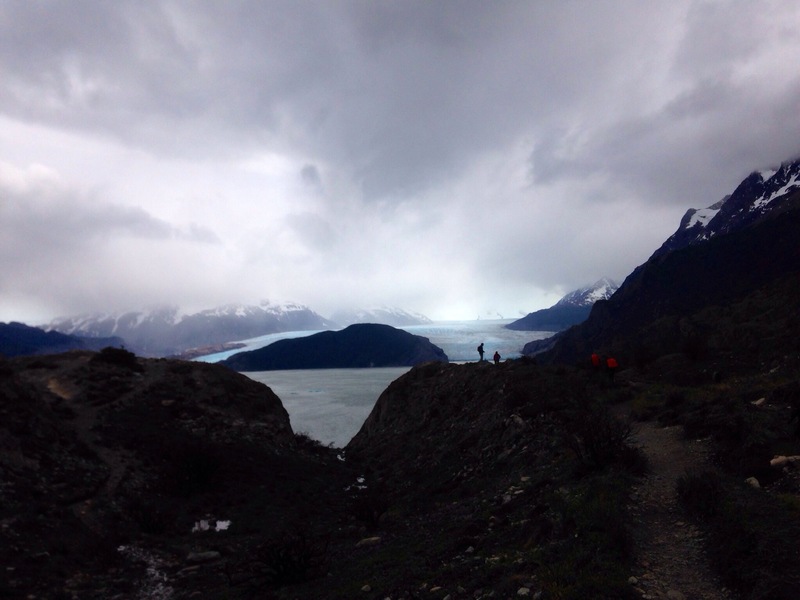 About 500 vertical meters above me – about a 45 minute hike – lies a laguna and the base of the three towers that give Torres del Paine its name. 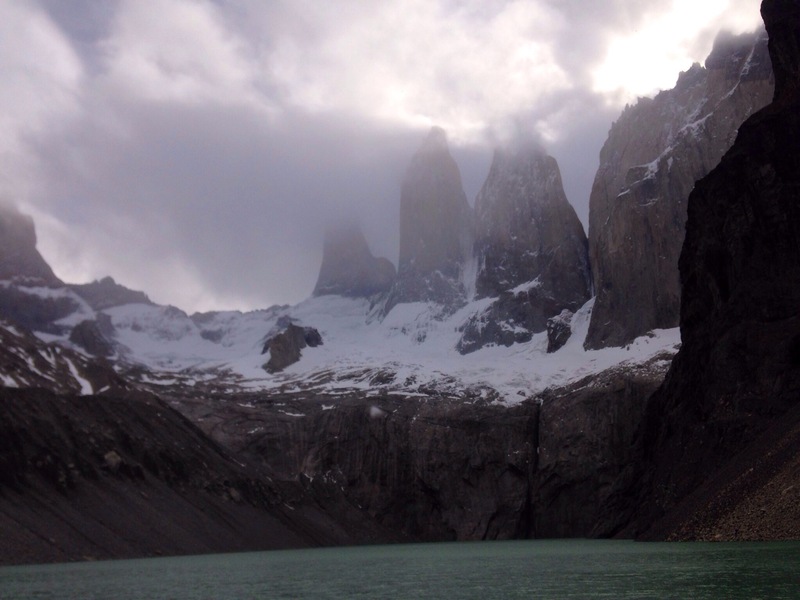 The three granite slabs stretch vertical, going straight up almost 2,000m from the laguna. I’m going there for the first sunrise of 2014. 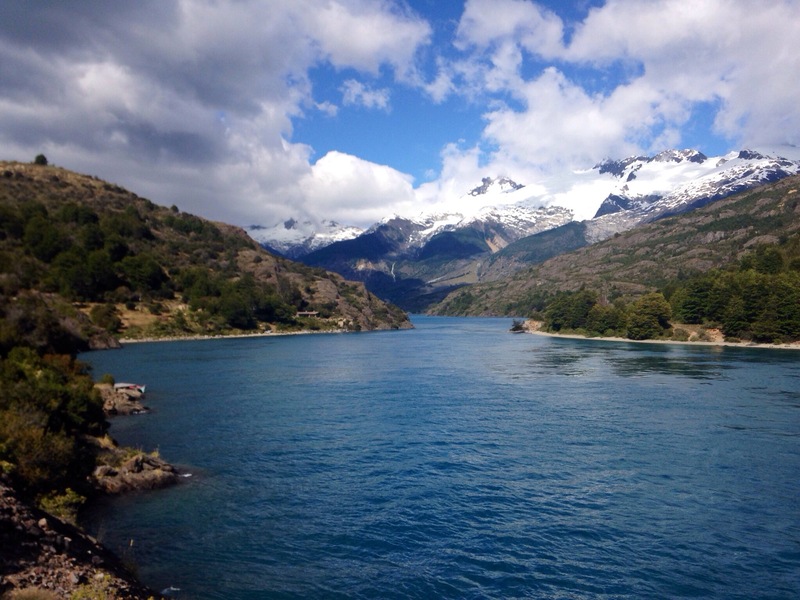 Torres del Paine National Park covers a large part of southern Chile. 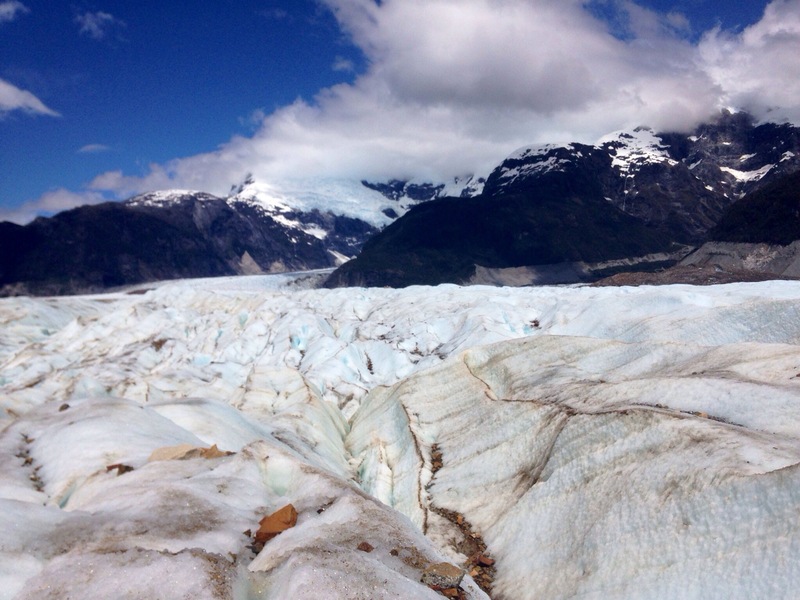 It stretches from the Argentine border west and south into the second largest ice field on earth outside of the poles (Greenland is larger.) 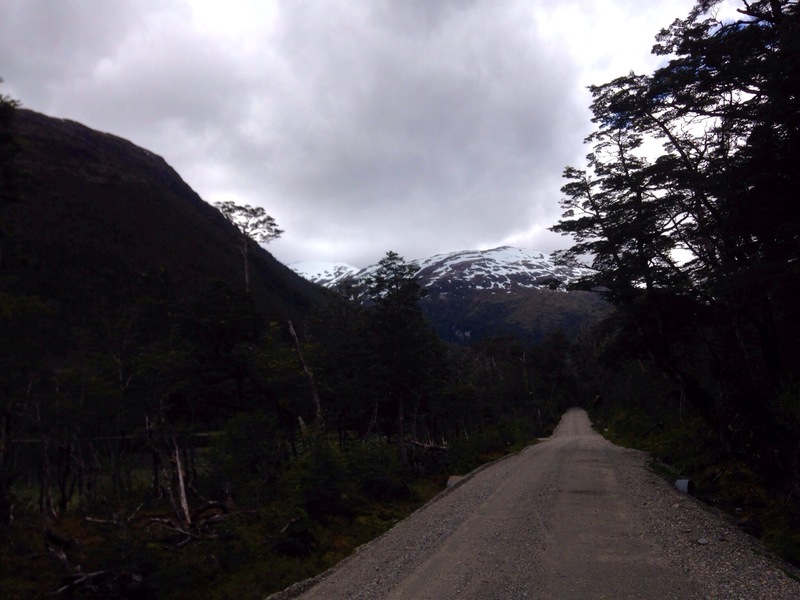 The park is about 1,600km north of Antarctica and is buried in snow most of the year. The map of the park shows many short hiking trails spreading out near the park entrance. However, the holy grail is the 120km loop encircling the mountains containing the towers. A couple hostels and shelters litter the bottom of the map near the park entrance. 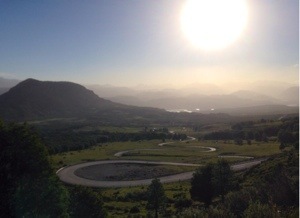 The top of the map – the back half of the circuit – is remote and few venture out there. 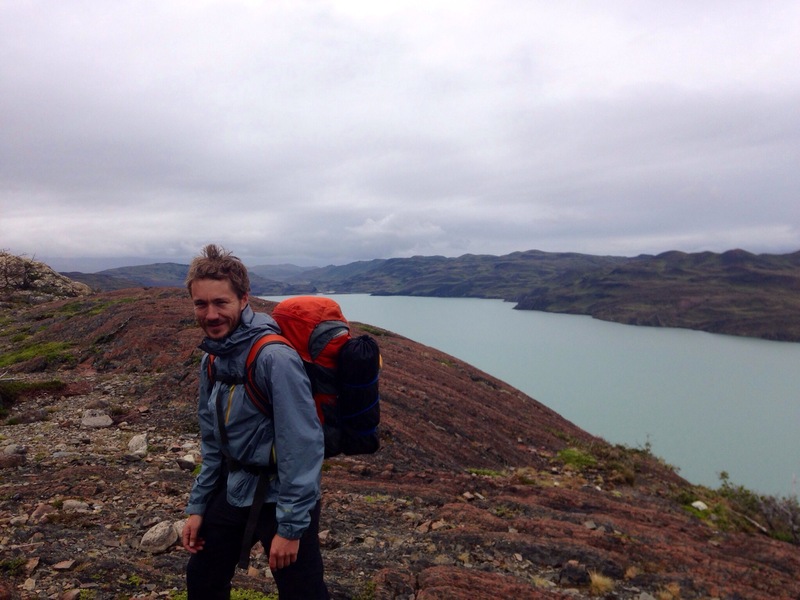 Leaving my bicycle behind in El Calafate and going further south with a small backpack by bus I’d made the transition from cyclist to hiker. 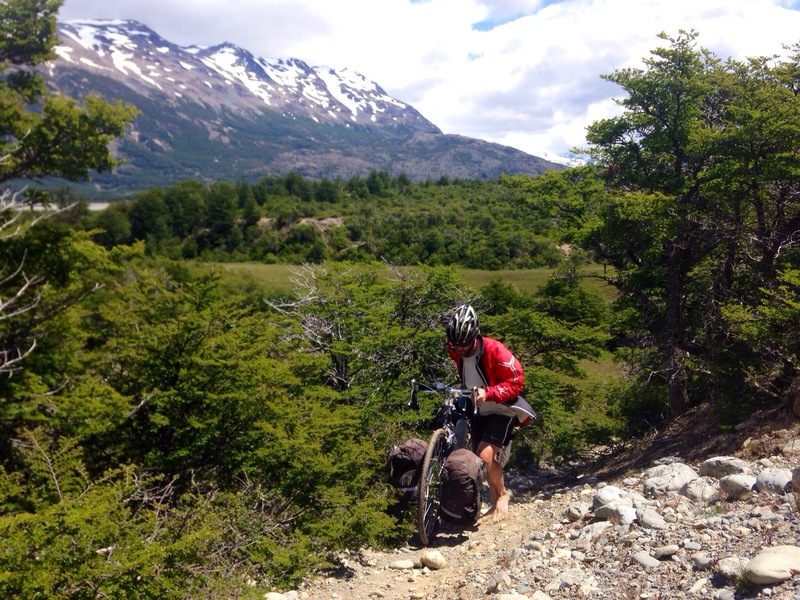 The cycling part of this adventure was complete; but there would still be 120km of mountains, glaciers, snow, mud, rain, sun and experiences to discover on foot. 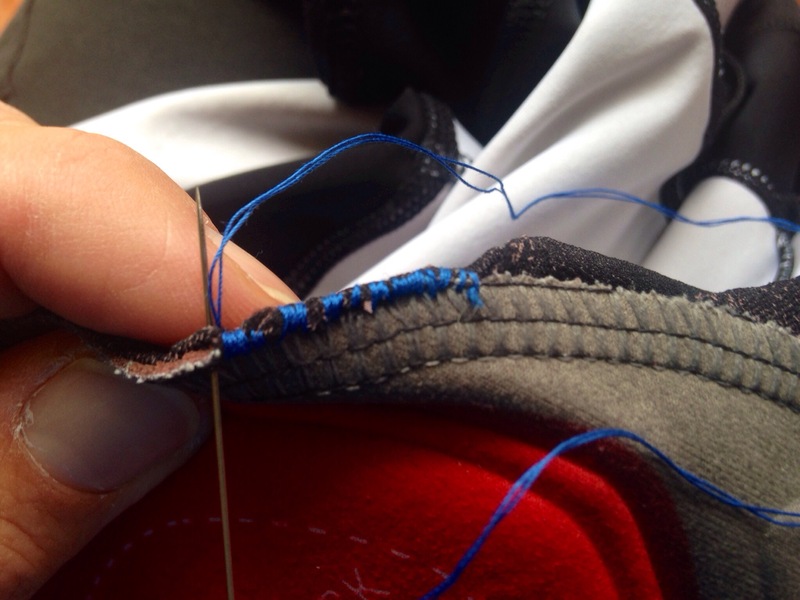 First, I needed to do some repairs. 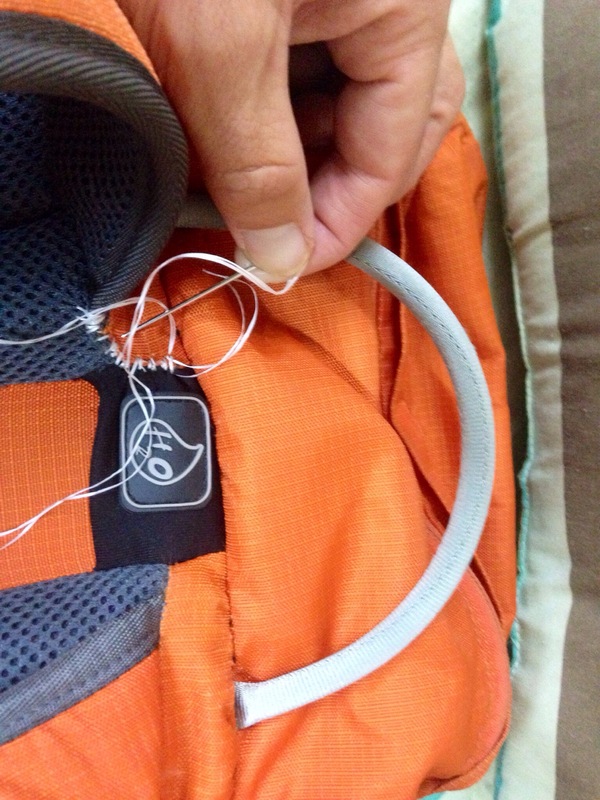 Wilson, my backpack, which has had more than it’s fair share of adventure, started coming apart at the seams. A huge needle and dental floss kept things together for what would probably be Wilson’s final adventure before retirement. I’d stepped out of a full bus and into the rain alone at the park entrance five days earlier. The others would continue another hour to the park’s main hotel and do the shorter circuit from there. I hadn’t come this far to sit on a bus any longer than I needed or to see a hotel; the rain on my face felt great as I began the next part of my adventure. 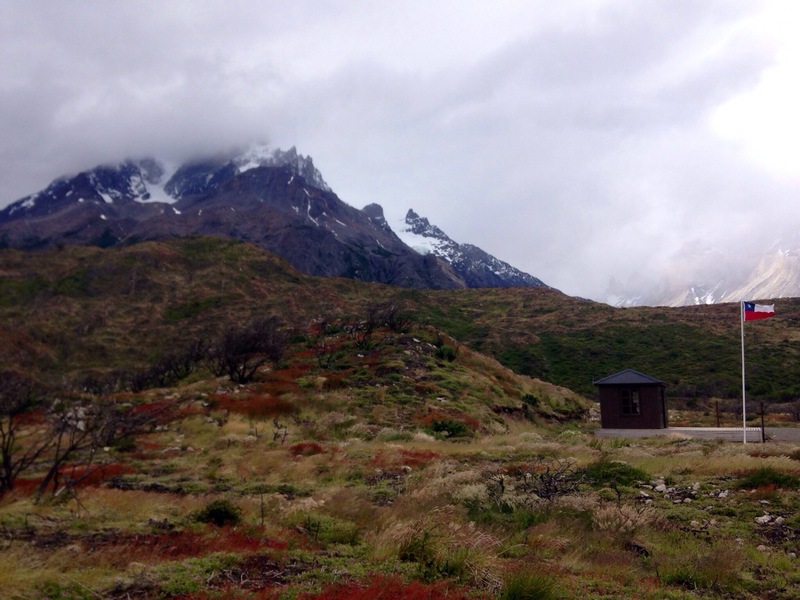 The weather cleared in the afternoon and I made it to what would be the best campsite on the trail – Refugio Dickson – next to a lake and at the foot of the biggest pass along the circuit. It was my birthday and when the Chilean guy in charge of the campsite found out and heard I was South African, he sang me a piece of Die Antwoord’s ‘Enter the Ninja.’ He couldn’t speak any English (or Afrikaans) but he knew those lyrics! 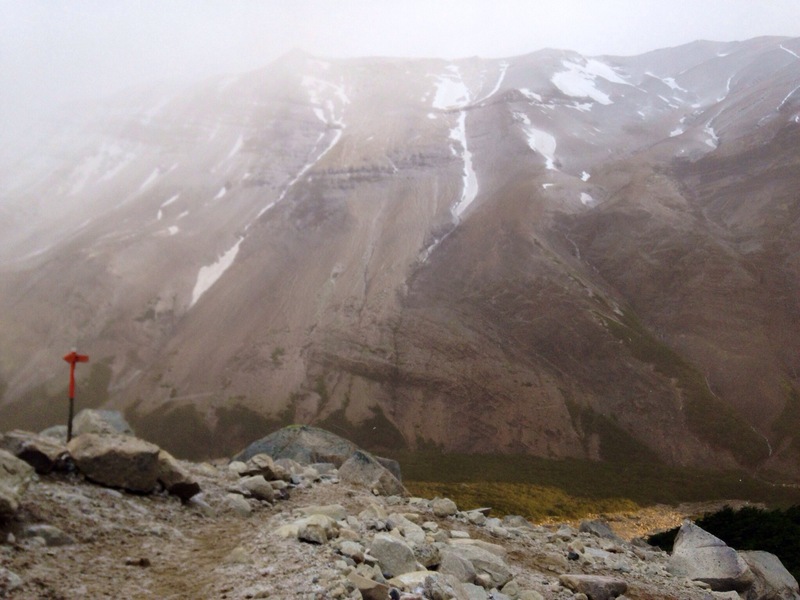 Day 2 started with a long gradual ascent up a valley before the trail kicked straight up climbing about 1,000m through scree and snow. It was also the only day where I would be concerned about my safety. Somewhere around midday the trail ended suddenly in a muddy patch of trees. I’d lost the trail I was supposed to be following. Retracing my footsteps a number of times I couldn’t find a way through the trees and out in the direction I should be going. I needed to get over the pass and drop down the other side (to where there would be less wind and positive temperature) before it got dark. I took a short break, studied the map and contour lines closer and eventually found the correct trail again. Fortunately, losing the trail turned out to be a non-event which had only cost me maybe 45 minutes. It was, however, a good reminder of how quickly things can go wrong in the mountains, and if they did for me, that I’d be alone and need to find a solution. 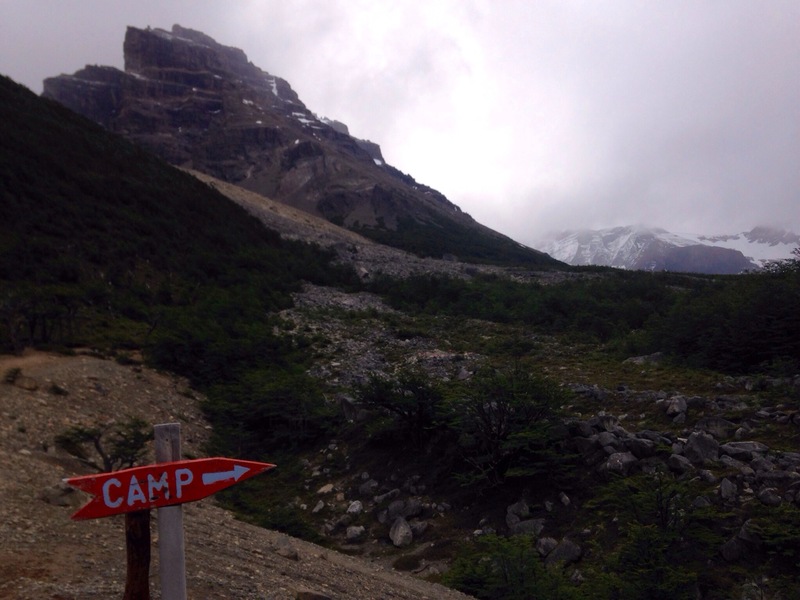 The reminder came at a good time – the trail was about to ascend into scree and snow and climb out of the trees and into the Patagonian wind. I climbed the pass safely. The other side dropped down to Glacier Grey. 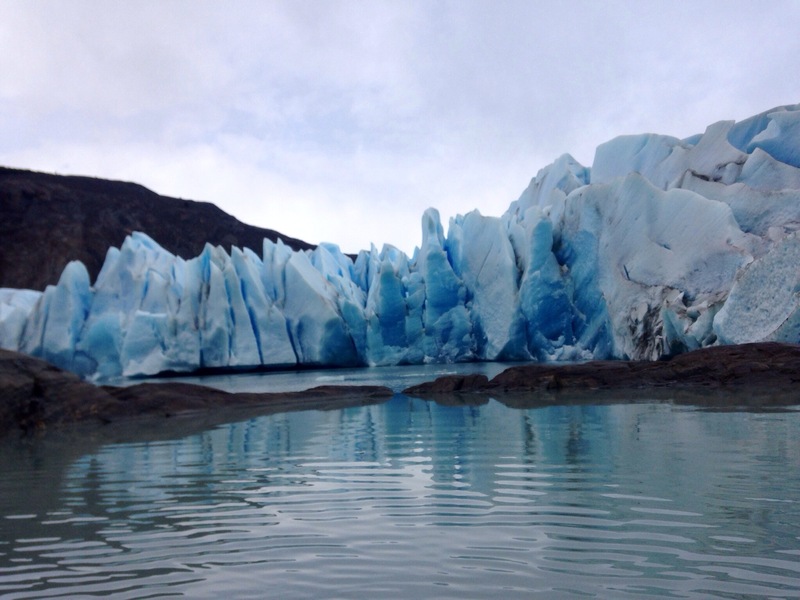 Grey is one of the larger glaciers protruding from the massive Southern Patagonian Ice Field into habitable terrain. Looking west along the glacier one can see part of the ice field which stretches away into icy nothing-ness and eventually becomes sky. 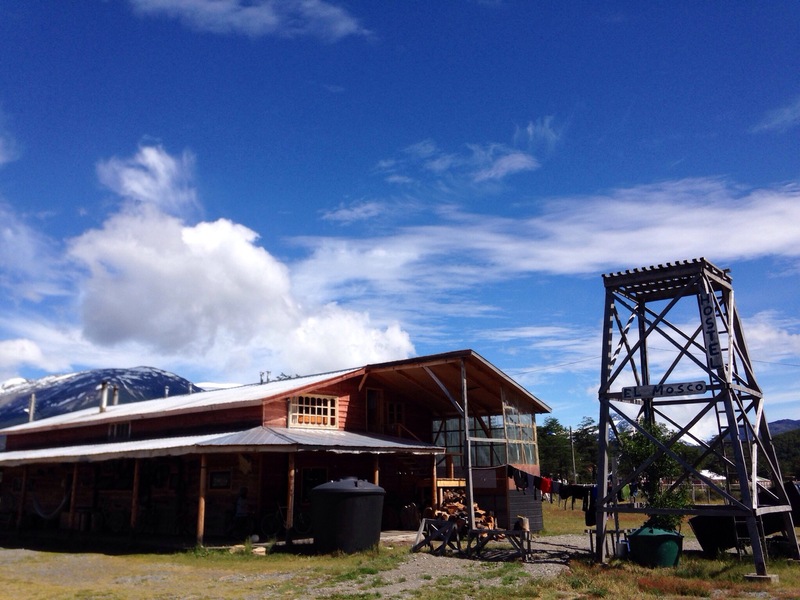 The campsite near the glacier does kayak trips and I spent the night there. 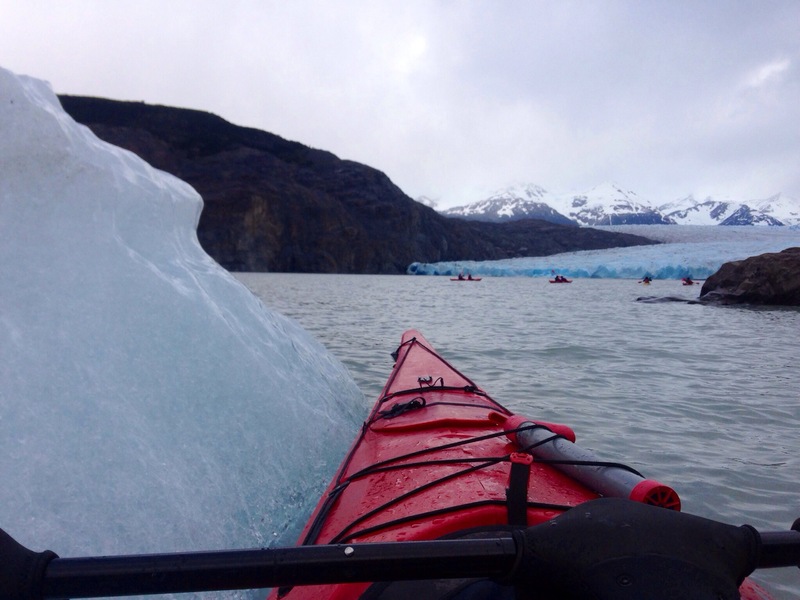 The next morning I paddled right up to the glacier, past huge icebergs that had broken off it over the past few days. I was told the water was constantly between 2 and 3 degrees. Falling out of the kayak was not an option. That afternoon I left the campsite and headed towards where the full circuit joins the shorter ‘W circuit.’ The remainder of the hike would be more crowded but also on better maintained trails and with more regular access to coffee and warm food. 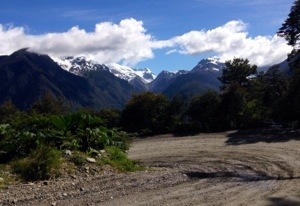 A couple more days took me to December 31st and the last valley of the circuit which lead up to the base of the towers. Starting up the valley there were two options. One is to leave your pack at the campsite at the bottom of the valley where there is a restaurant and showers and hike up to the towers and back in a day. 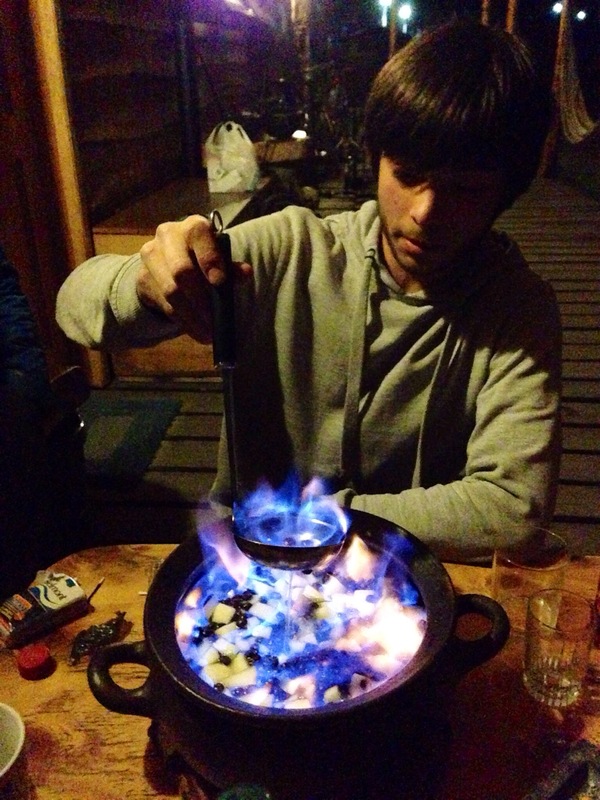 The alternative is to take everything to the top of the valley and spend the night in the most basic of campsites. Sleeping at the top of the valley would make a sunset or sunrise mission to the towers possible. I decided to spend the last night of 2013 at the top of the valley and to do both sunset and sunrise. 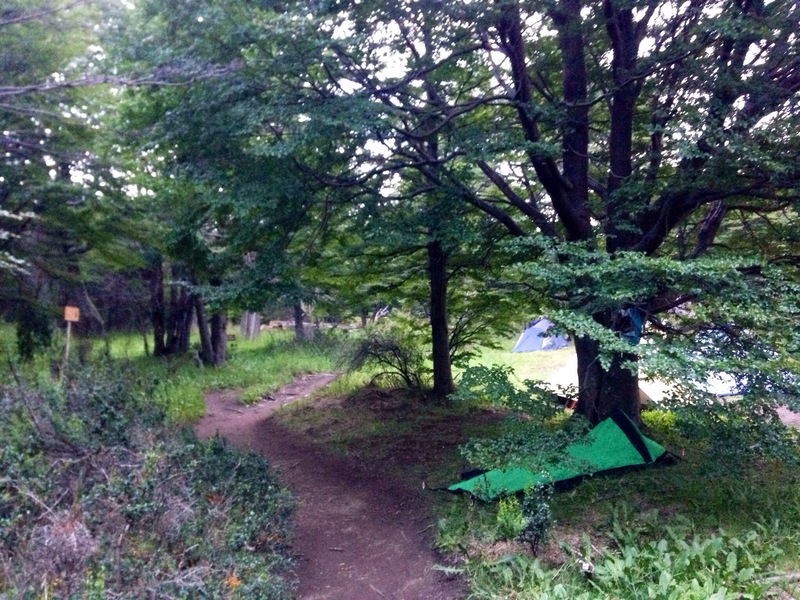 There weren’t many hikers camped at the top campsite, and even less that were awake at midnight. 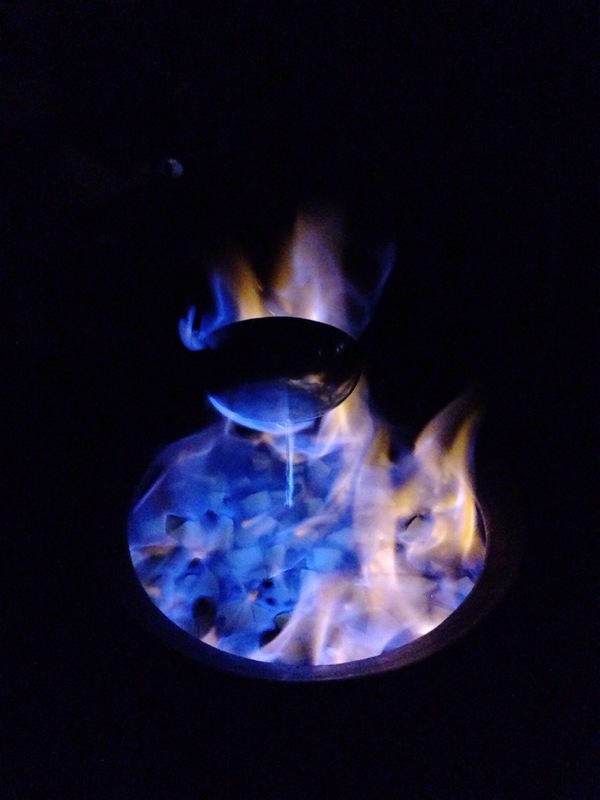 We shared the few half-bottles of wine that had made it up the valley and demolished whatever chocolates or rations had survived the hike up to this last night. A couple hours sleep and then a short line of headlights made their way up to the towers to watch the first sunrise of 2014. Dropping back down the valley away from the Torres I would start my journey back to civilization and then to Cape Town. A few hours down the valley I passed the other campsite and could get a hot breakfast and coffee. Later I would arrive at the park entrance where I had started the circuit 5 days earlier. 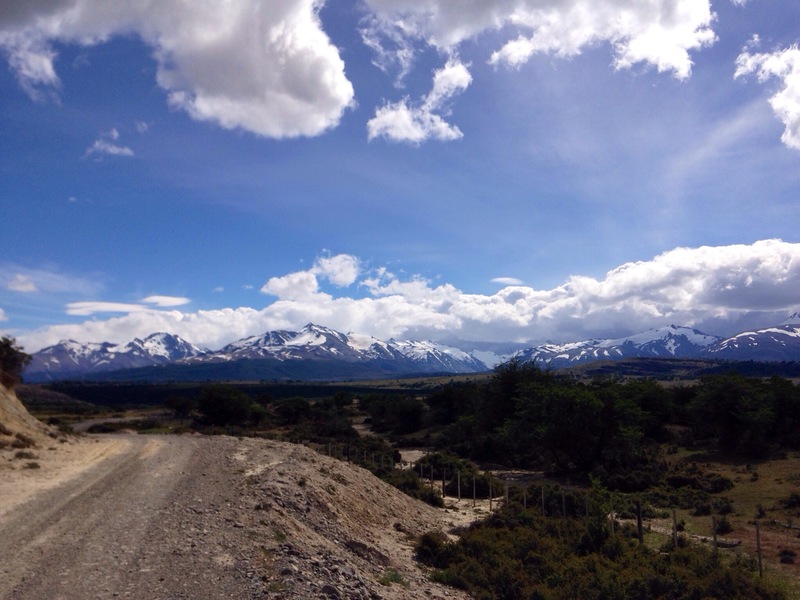 From there I’d hitch a lift back to the Argentine town of El Calafate with a French couple in a 4×4. Approaching El Calafate my phone would jump to life when it found a patch of reception. Many luxuries which we usually take for granted would follow – a shower, milkshakes, wifi, sheets, burgers, shelter from the wind, clean clothes and skype. 16 backpackers and cyclists gathered outside the ferry captian’s house on Sunday morning at 8:30. 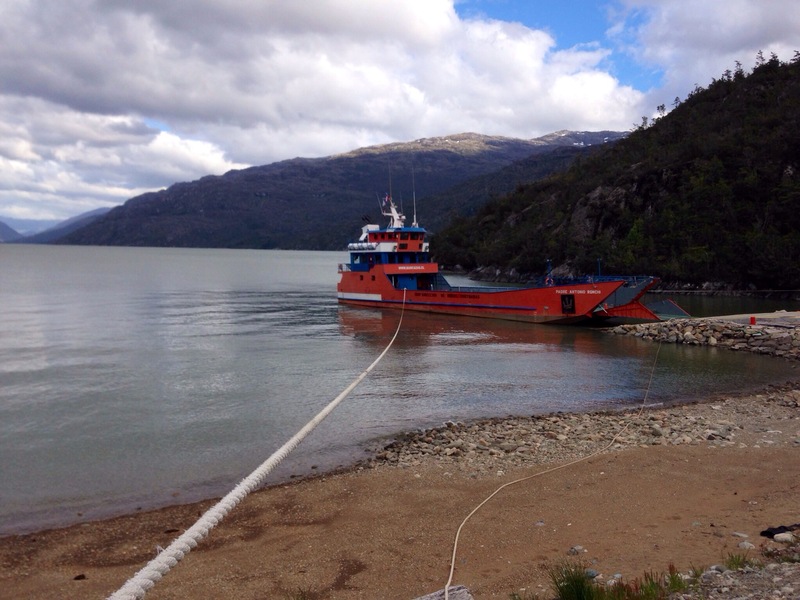 The ferry was still being repaired, but the captain had arranged another smaller boat. 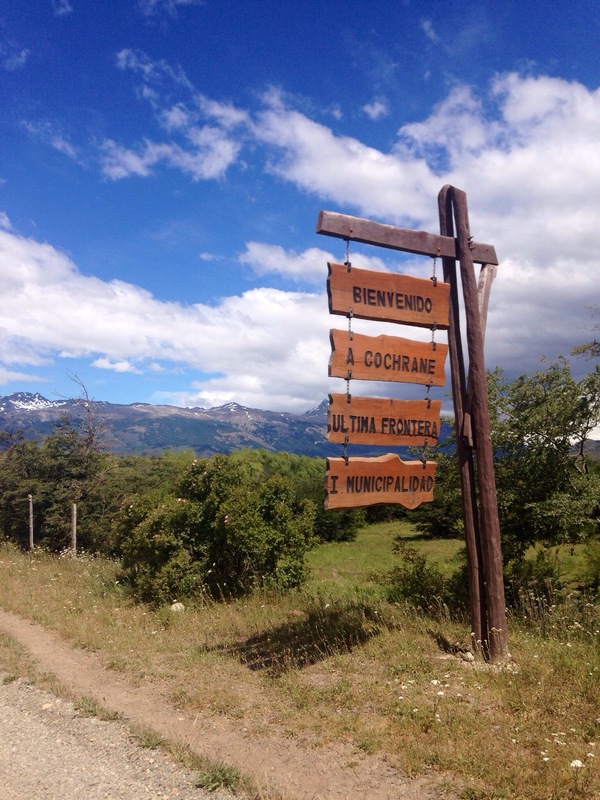 The previous day he (and the chef working across the road) had confirmed, once again, that ‘mañana’ (tomorrow) would be the day that we could cross the lake into Argentina. The smaller boat had space for 15, something all 16 of us knew but nobody mentioned. A few minutes later the captain’s wife emerged from their house and let us know that the weather was ‘bad’ and that we should come back mañana. This was my 4th day in O’Higgins waiting to cross the lake and the promises of mañana weren’t sounding any more certain as time passed. I decided to take my chances with Paso Rio Mayer. 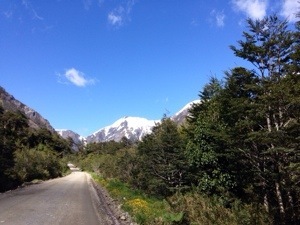 Going east through the pass, dropping away from the Andes into the pampas and then looping back further south to get to El Chalten (other side the lake) would add a few hundred kilometers to the adventure. It would also be the only way to escape from O’Higgins. I announced my plans to what was left of the 16 and convinced James, a British guy that had been cycling for months, and 2 Germans to join me. 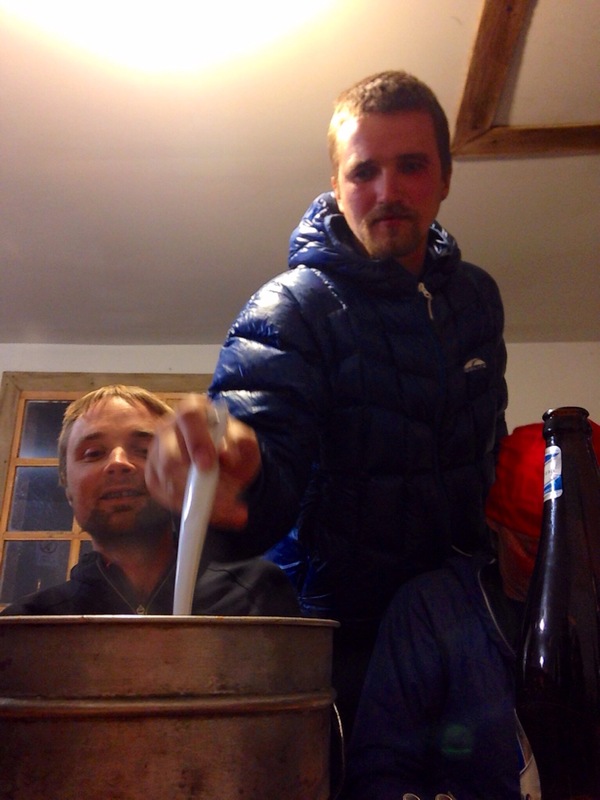 The Germans needed to get more food in town and while they did that James and I started up the pass. 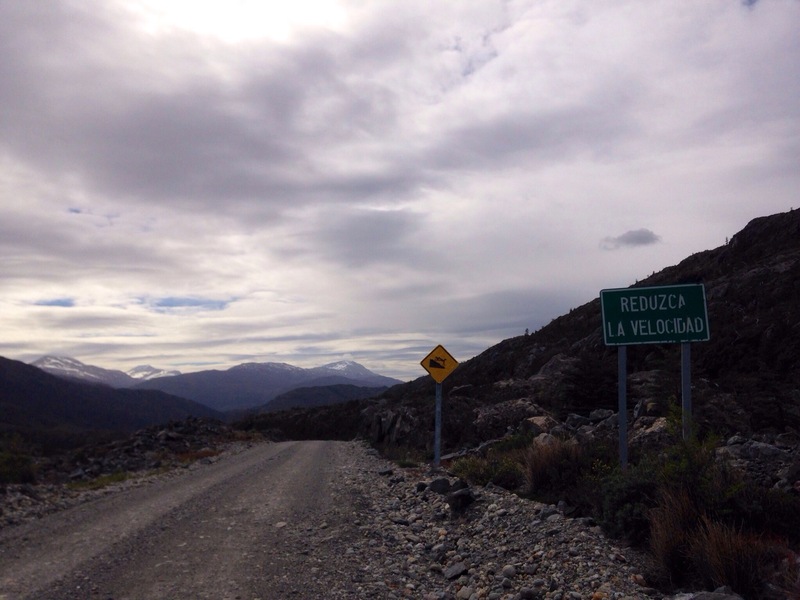 45 kilometers later we found the Chilean border – a small outpost at the end of the track that wound through the pass. The only indications that it was an official building were the circle of rocks marking a helipad and the tatty Chilean flag fluttering in the wind. 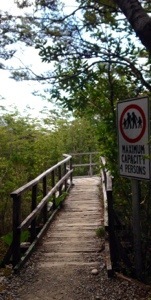 The next 20 kilometers were incredible. Real mountain biking! 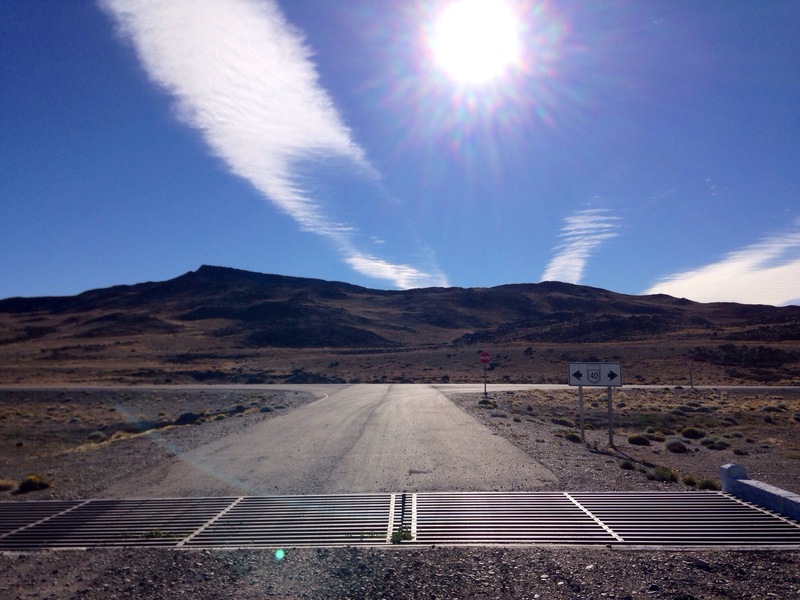 The Chilean border officer explained to us that there were no roads for our bicycles until we found the Argentina border post. 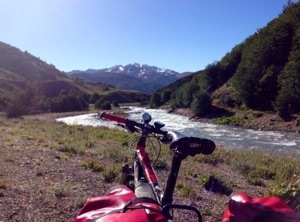 He also mentioned there would be some river crossings and that we should ‘turn right at the fence.’ We walked, carried out bicycles and cycled whatever we could as we traced a dotted line on my GPS east through fields, forests and rivers in search of the Argentina border. 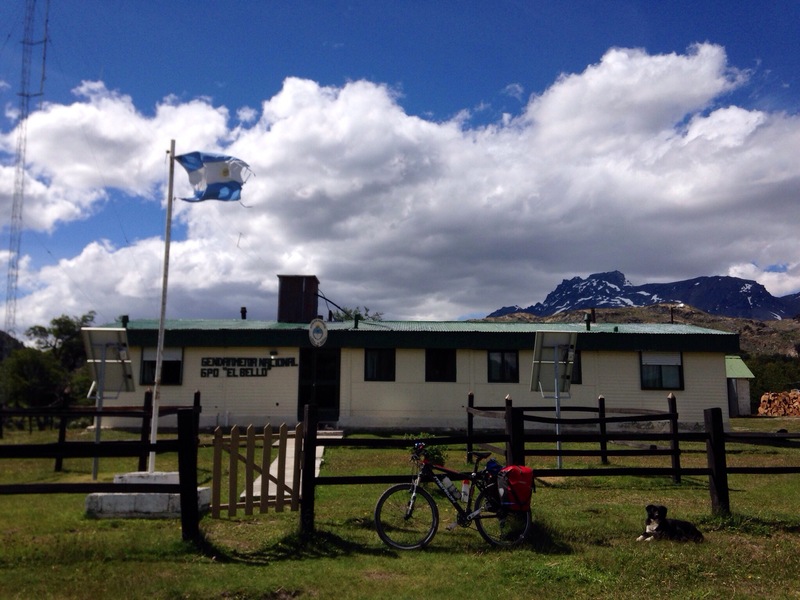 A few hours, lots of mud, countless river crossings, a dodgy swing bridge and some awesome mountain-biking later James and I spotted the Argentine flag flying next to a small white building. The border guards were pleased to have something to do and took their time checking and stamping our passports. 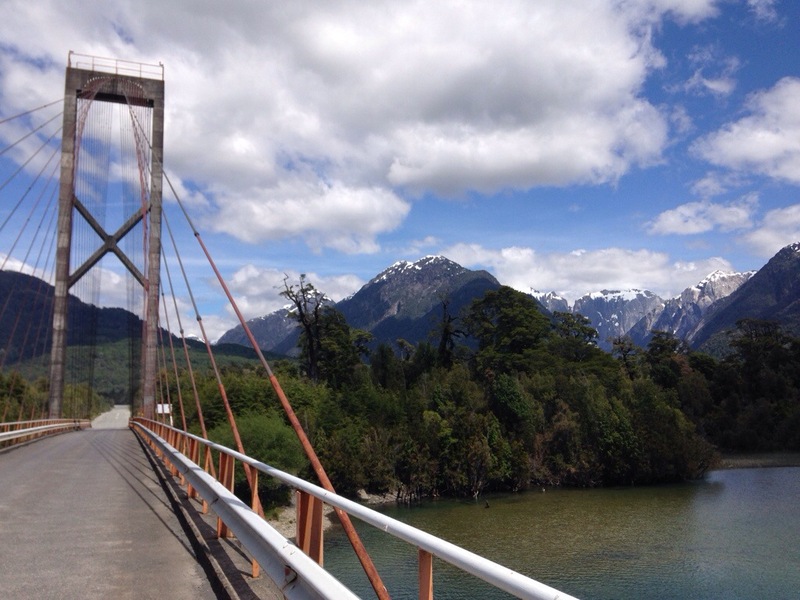 We had crossed the Andes from Chile to Argentina! Looking ahead the mountains dropped down and flattened out. The Germans hadn’t caught up with us yet and James wasn’t planning on going too much further that day. 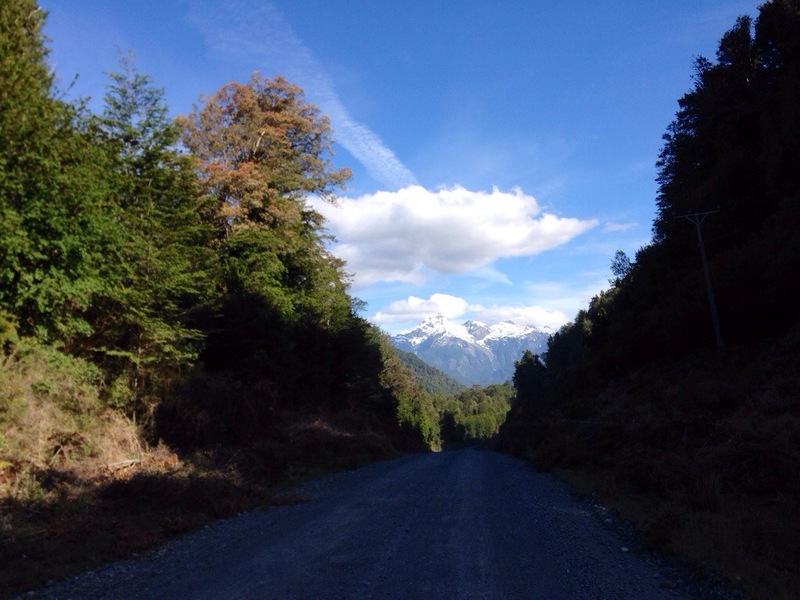 I wanted to knock off the 120km between the Andes and Argentina’s Route 40 that afternoon. We said our good byes, wished each other luck and I took off for the main road. Route 40 came into sight a few minutes before sunset. 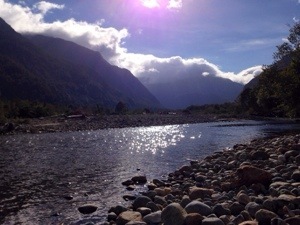 I found a spot near a river to camp for the night, very happy that I had managed to navigate the 185km’s from O’Higgins, over the pass, across the remote border and then all the way out of the mountains to the main road. 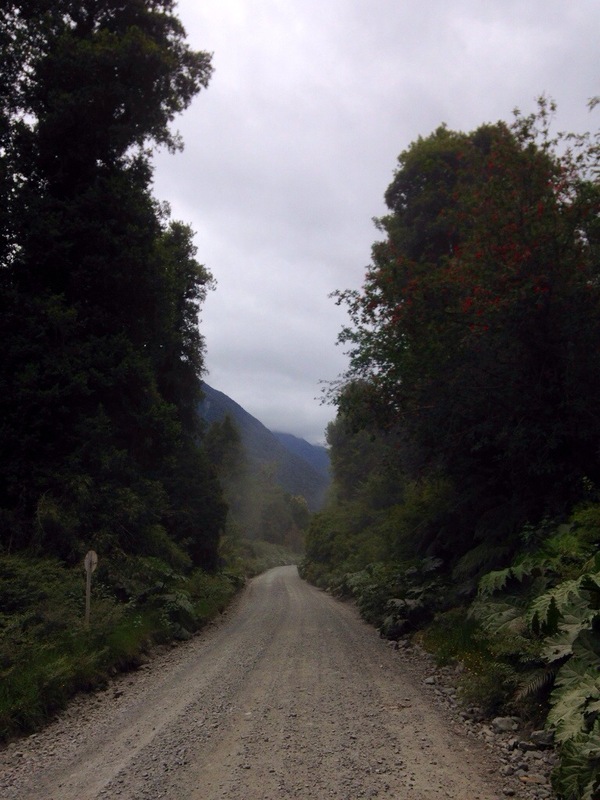 The next day looked relatively easy in comparison – 125km of paved road to the town of Gobernados Gregores. I was to be proven wrong. 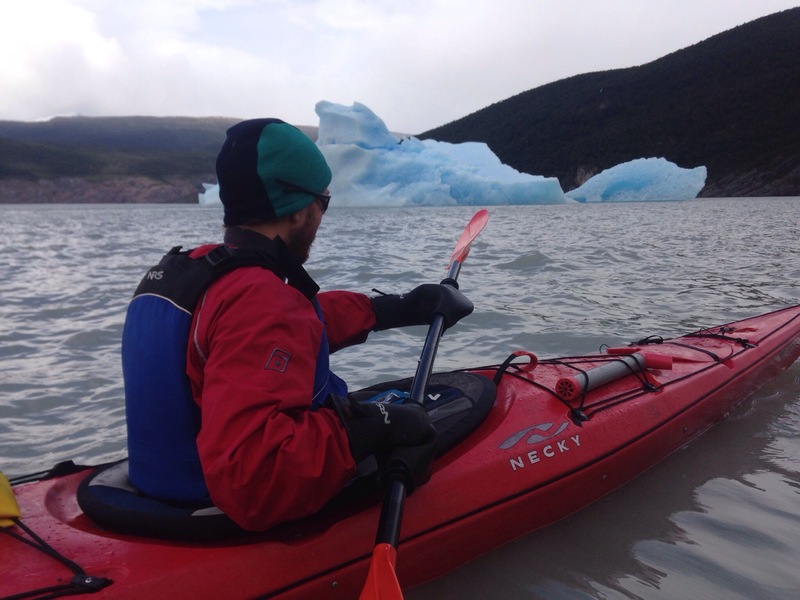 There are no easy days in Patagonia. 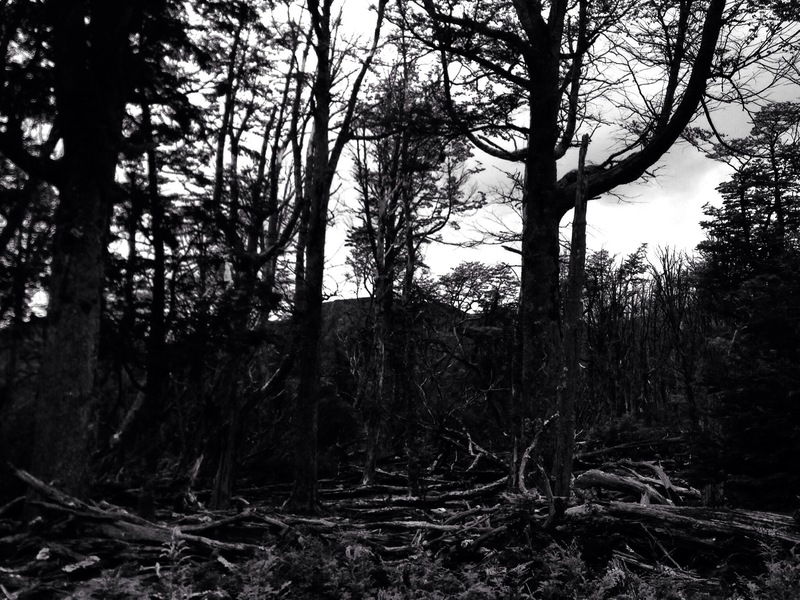 The wind sweeping over the Andes and across the continent to the Atlantic is relentless. And it’s really, really cold. With the wind at my back I would run out of gears as I was pushed forward at over 45km/hr. Turning sideways across the wind is extremely dangerous – it’s impossible to keep a straight line on the side of the road. Trying to pedal head on into the wind is almost futile. Progress can be made but cost of doing so in terms of energy loss is incredible. 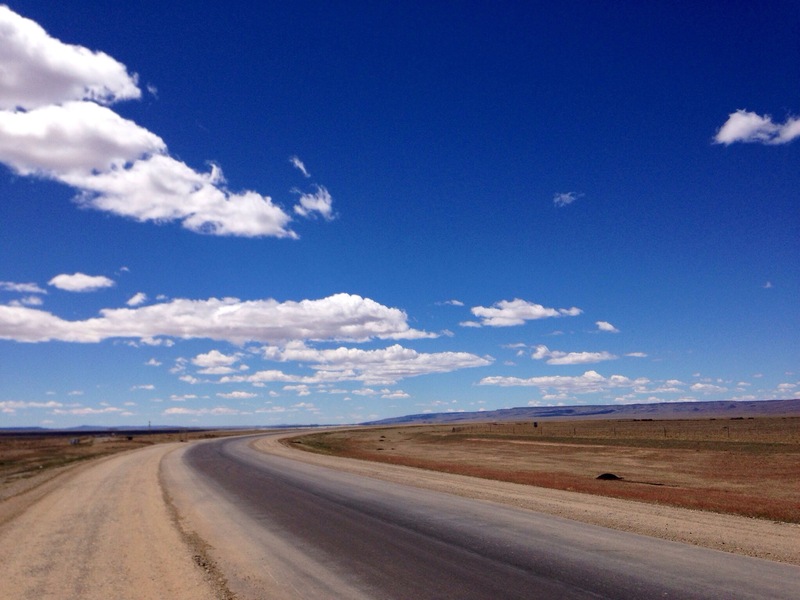 The never changing view – a flat wind-swept desert – does nothing to make this experience pleasant! Moving forward is more of a mental game than a physical challenge. Cycling into the wind became a formula. Fighting against it I could get my speed up above 10km/hr, but I couldn’t maintain that all day. I settled for a consistent 8-9km/hr, stopping regularly to eat and take a short break from the struggle. I arrived in Gobernados Gregores many, many hours later. Shattered. My Spanish is quite rough; that afternoon I was struggling to put English sentences together. 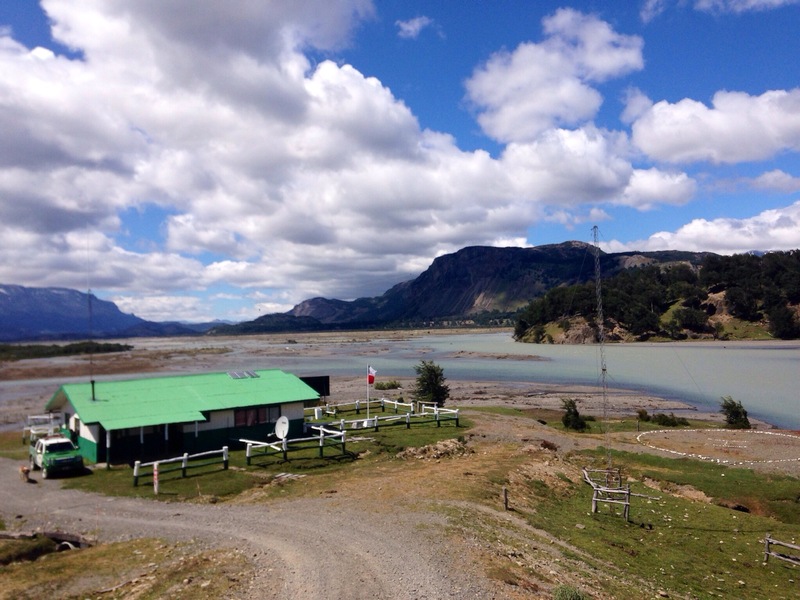 El Chalten is 310km south-west of Gobernador Gregores. 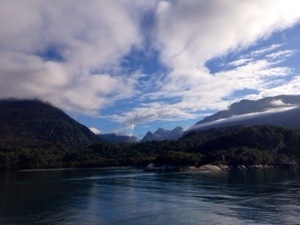 The wind sweeps across Patagonia from west to east. I did the maths; 310km divided by around 9km/hr. The answer scared me. 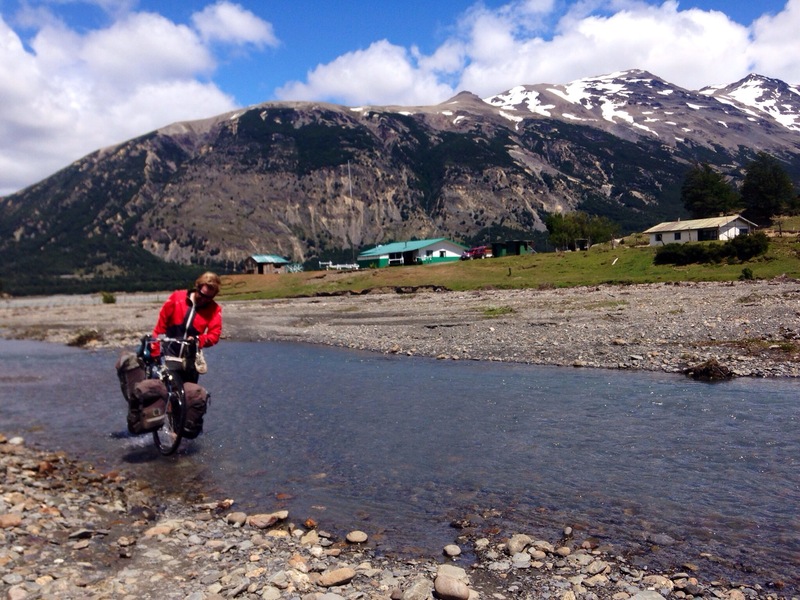 Hitching a lift to El Chalten was also an option, but not yet. 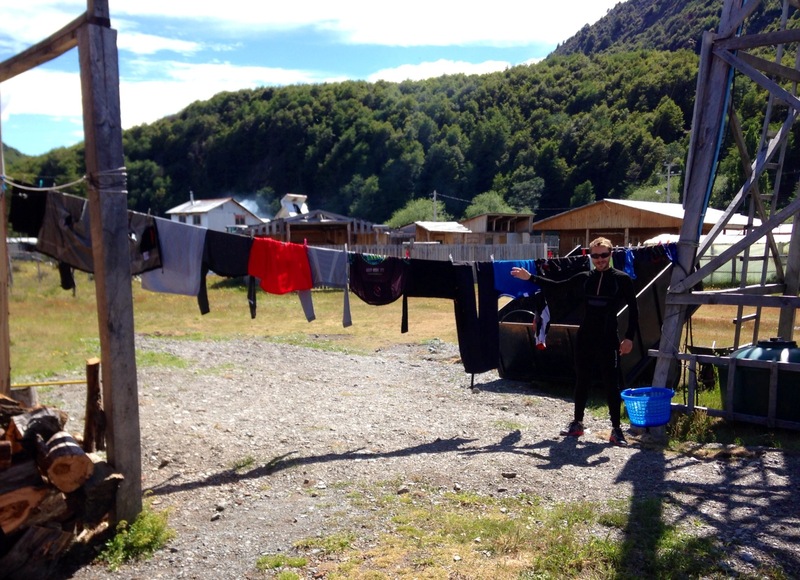 I wanted a round 2 with the Patagonian wind. I wasn’t ready to stop and wanted to see how far I could get. Maybe day 1 in the wind was as bad as it gets and I could make those 310km’s? I needed another day out there. I decided to do the 60km’s out of town to the first intersection the following day. 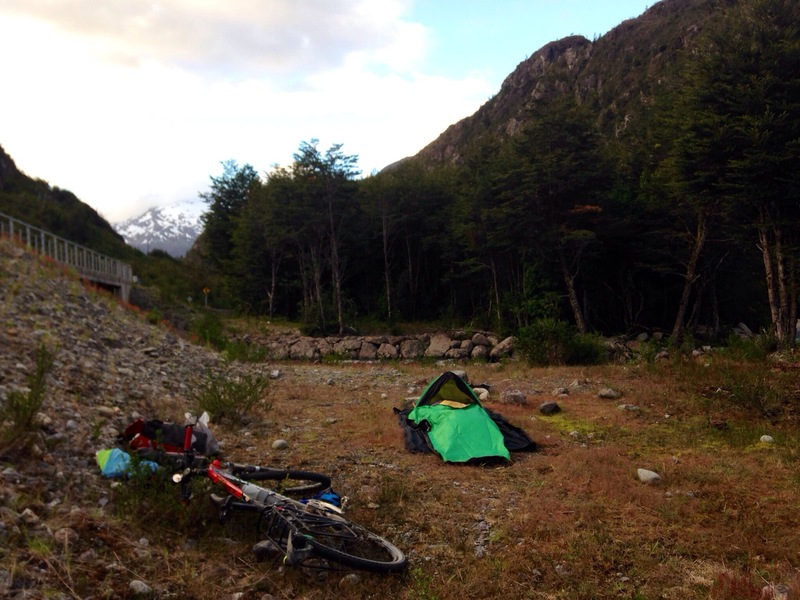 When I got there I would make a call on how to deal with the remaining 250km to El Chalten. The bakery in Gobernador Gregores sells amazing cheese & ham filled pastries. These are also useful when measuring riding time – I bought 10 and planned to eat 1 per hour. That way I would know how long I had been riding: 10 – X hours, where X = the number of pastries left in the bag. 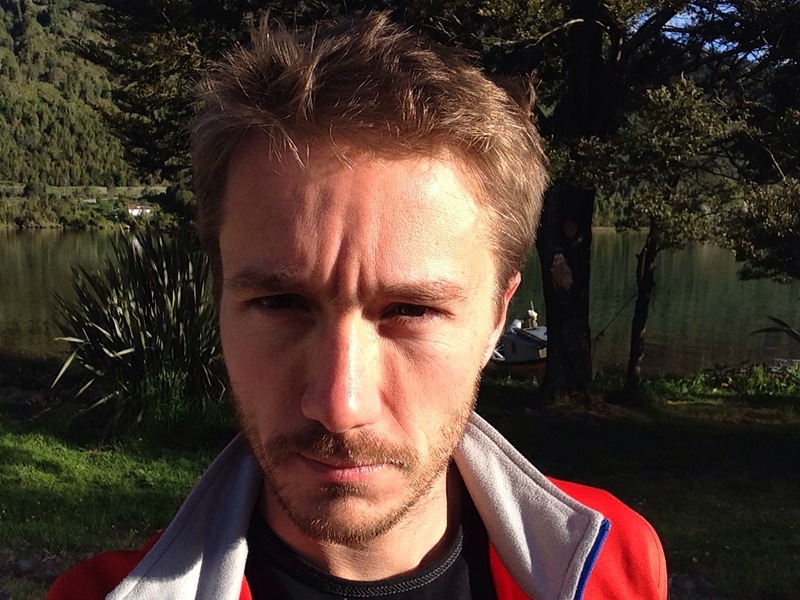 If Patagonia was going to get all formulaic on me with its headwinds I would have to hit back with heaps of determination and some formulae of my own! A few minutes after 7:00 the next morning and wearing all the warm clothes I had with me, I packed in the mountain of food I would need, loaded extra water (I took 5 liters) and aimed my bicycle south west. Trying to get up to 10km/hr I started counting down until I could eat the first pastry. Words, or even formulas, couldn’t capture the challenging hours that passed that morning. There were times when I stopped after an hour to inhale another pastry, looked backwards and could still see where I had stopped an hour earlier. The intersection at 60km coincided with my 6th pastry. Round 2 with the wind wasn’t any faster than round 1. 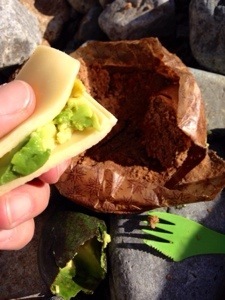 Given enough pastries (about 25) I could cross the next 250km of desert to El Chalten. I didn’t have that many pastries or the desire to see any more of the desert. I decided to hitch a ride with the next vehicle that came past, but would keep grinding forward until that happened. Two hours later the first headlights appeared on the horizon behind me. I stopped and waited a few minutes. 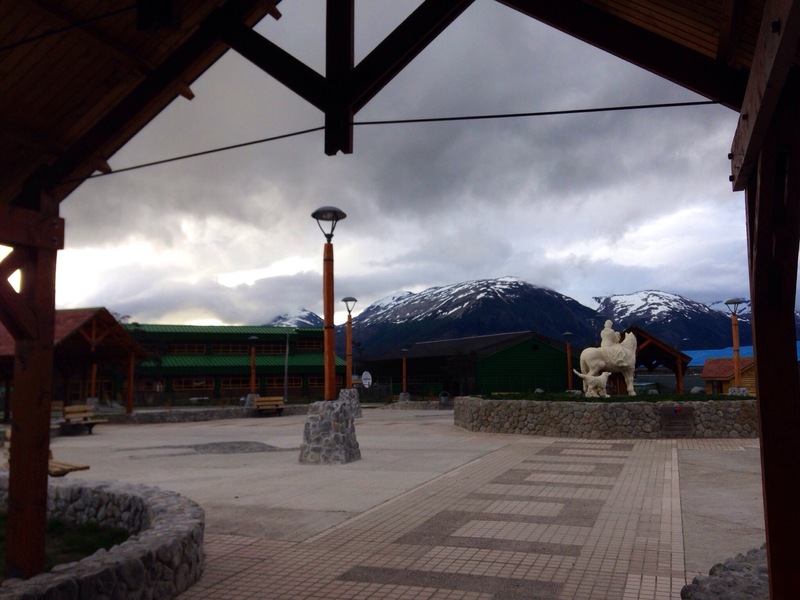 The lights belonged to a motorbike – a German guy traveling down to Ushuaia. 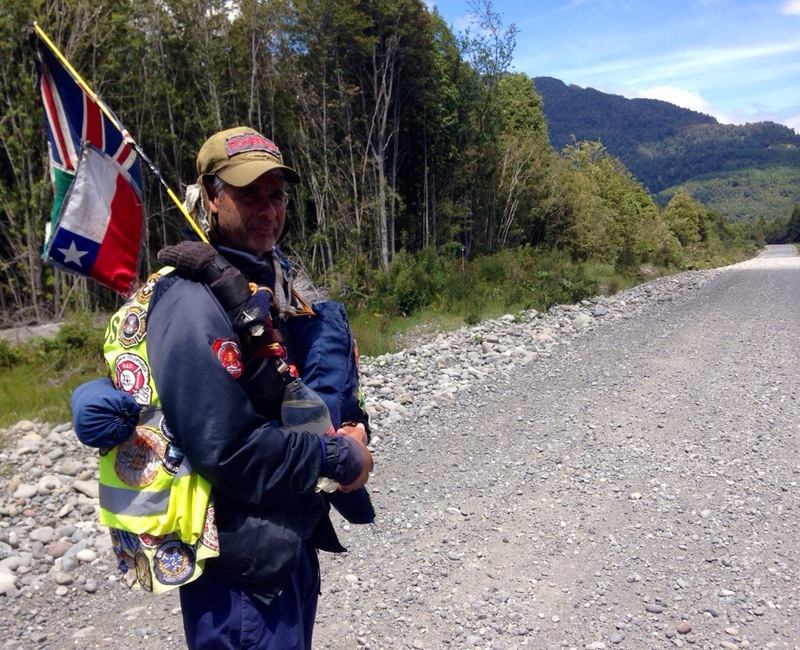 He stopped and offered me something to eat and drink. It was late afternoon already and fast approaching Christmas eve; we wished each other Merry Christmas and continued our solo journeys across the desert. An hour later another vehicle appeared, this time it was a bus! The bus stopped next to me, the driver got out, looked at me and said: ‘Como estas?’ He gestured for me to join them on the bus and said that they were going to El Chalten. 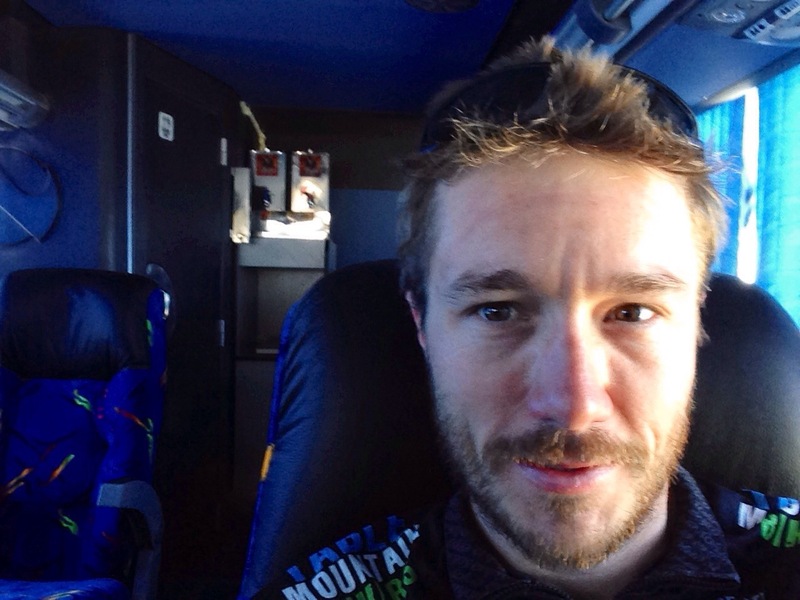 Around 16:00 I got on the bus, having covered 75km’s in almost 9 hours. The remaining 235km would take only 4 hours, while a reclining seat absorbed my entire body and I ate through most of the food I had stockpiled. 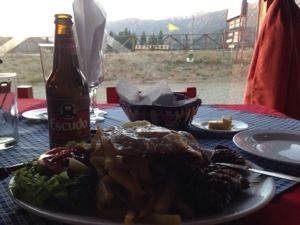 On Chrismas eve I was delivered to the centre of El Chalten. Leaving the bus terminal I ran into some of the guys that had also been waiting for the ferry in O’Higgins. Some had gone back to the previous border crossing and others waited until the ferry did eventually operate. 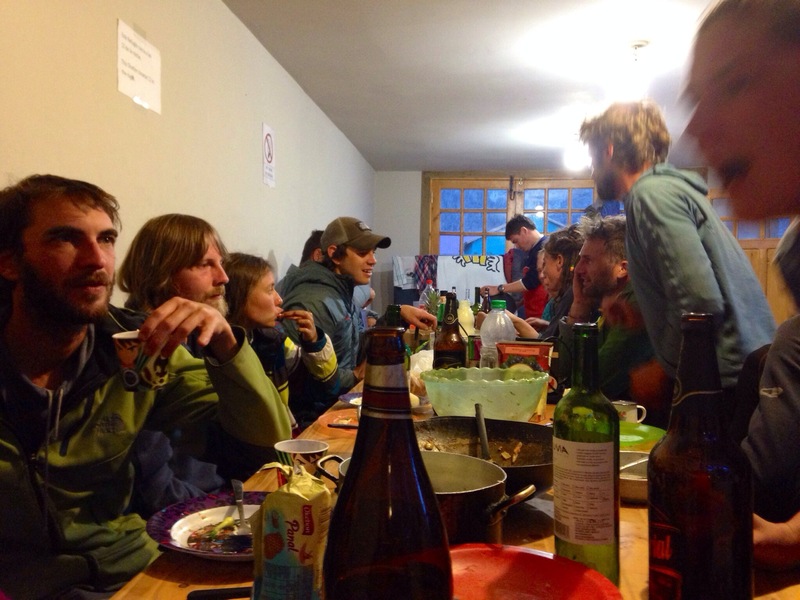 Somehow almost all 16 had all arrived in El Chalten minutes apart, and just in time to cook up a huge dinner and celebrate Christmas together! 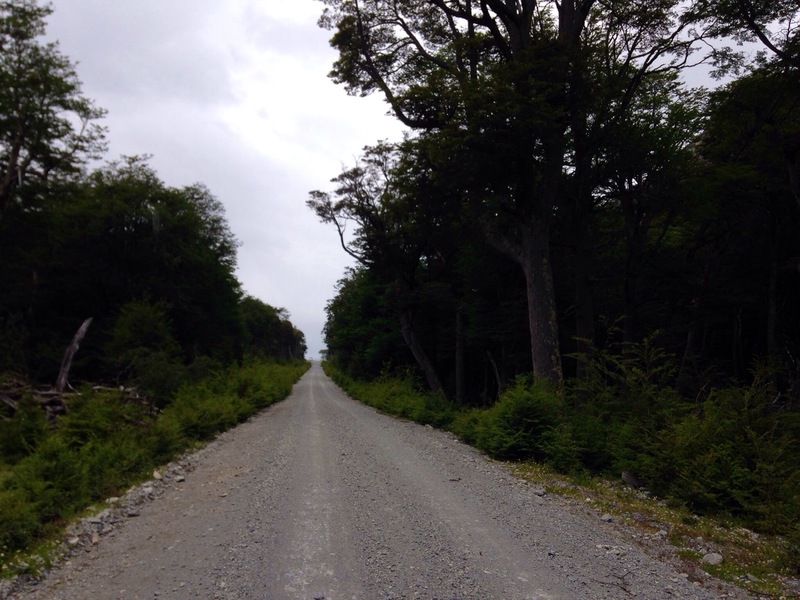 A few hundred kilometers, a few more days – time and distance are becoming inconsequential – and I’ve reached the end of the ‘road.’ A rough track comes into the north of Villa O’Higgins while Chile’s deepest lake isolates the village from Argentina to the south. This last section has been the most remote of the trip. 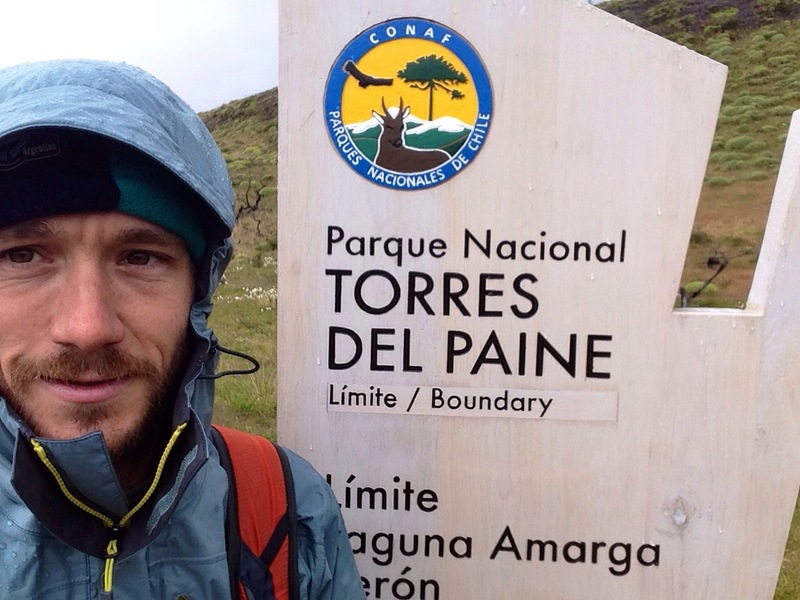 No food or accommodation for days, really cold weather, some rain and wind. A lot of wind. 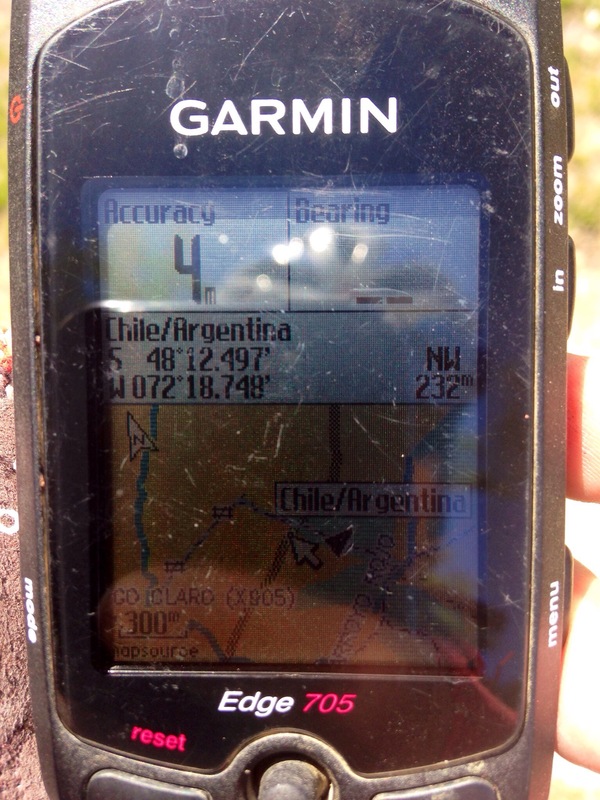 According to the GPS maps of Chile the road should have ended about 230km north of here. The next step is to cross the lake into Argentina. Unfortunately, the rumors along the road about the ferry not being operational are true. 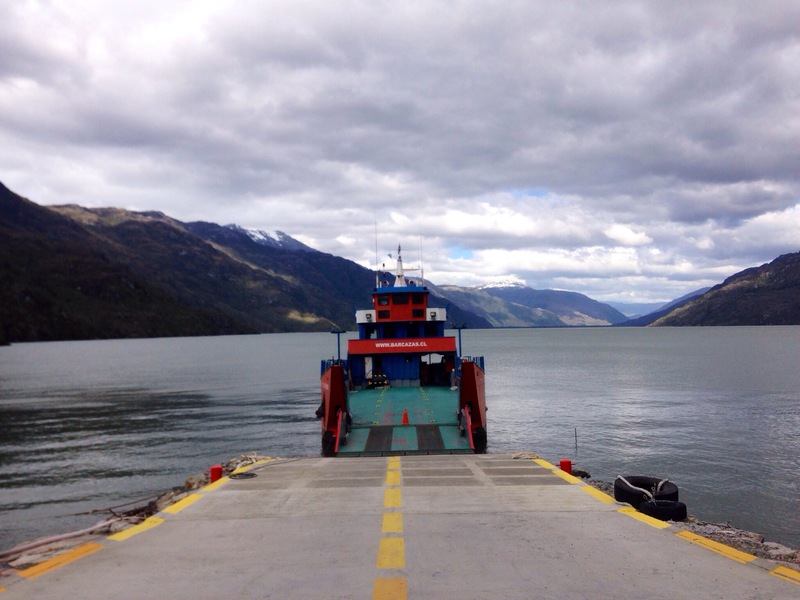 There are other travelers that have been waiting for the ferry for some time – it’s been almost 2 weeks since the ferry last crossed the lake. 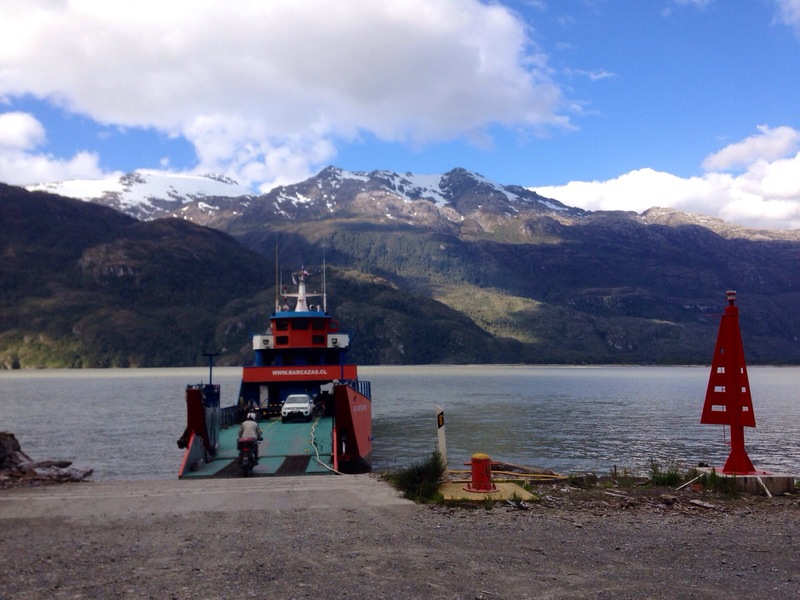 Some guys tried to leave town a number of times after their ferry-waiting-patience came to an end. Their first attempt ended with a broken rear axel so they walked back. Yesterday they got a lift with a 4×4. The 4×4 had 2 flats and had to return to town for repairs. They left again this morning…. 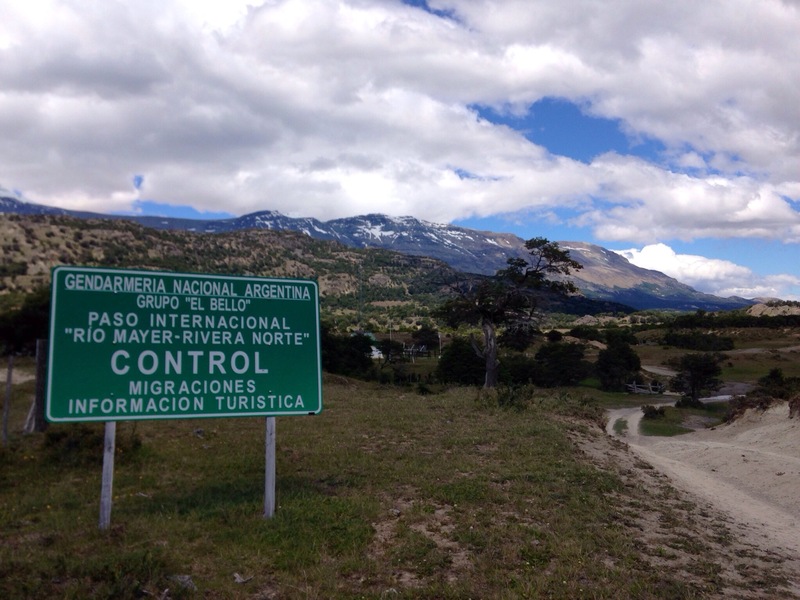 Option 1: Go backwards about 250km and enter Argentina on a road there. 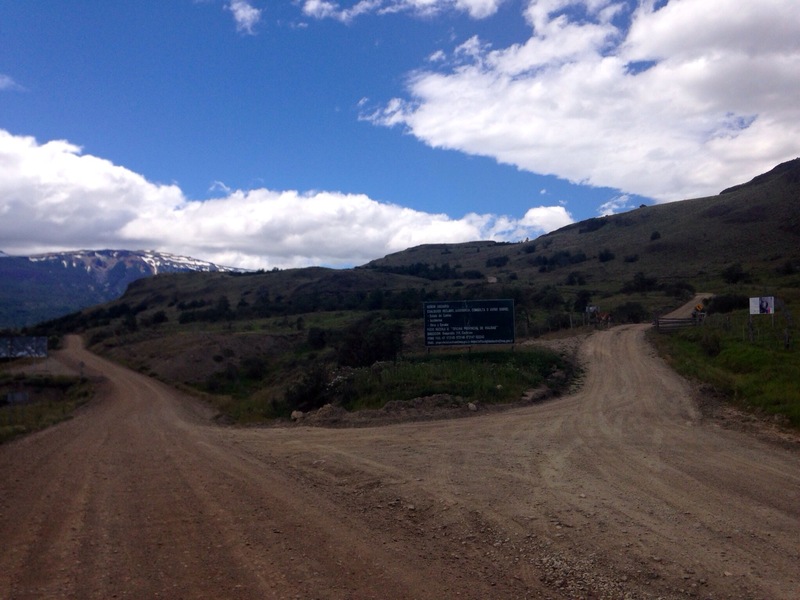 Option 2: Go through the Rio Mayer Pass. 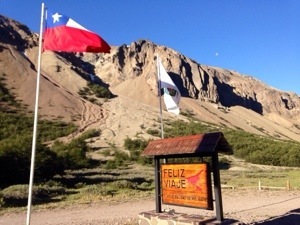 A few kilometers before town there was a track going east which climbs up the Rio Mayer valley and ends near the top – about 25km up. 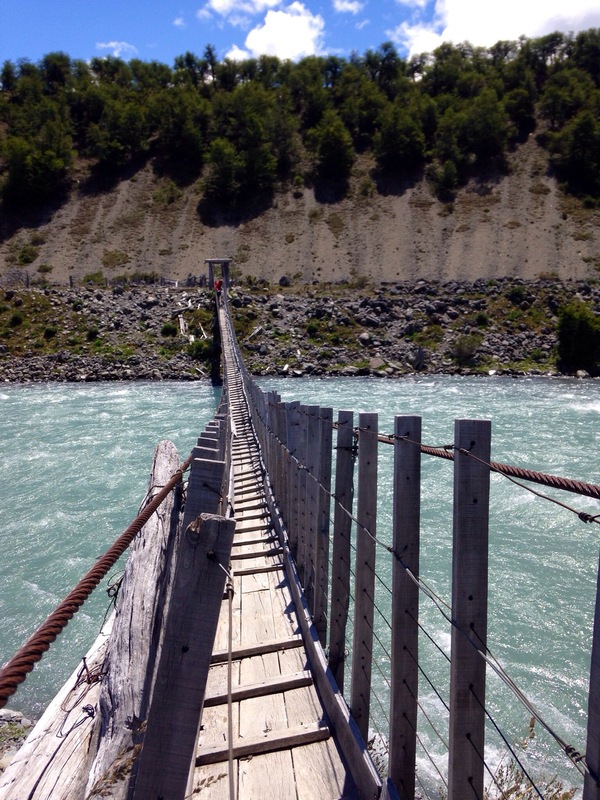 From there it’s possible to hike around 20km, crossing the river on a log-bridge, and pick up a similar track that drops down into Argentina on the other side. 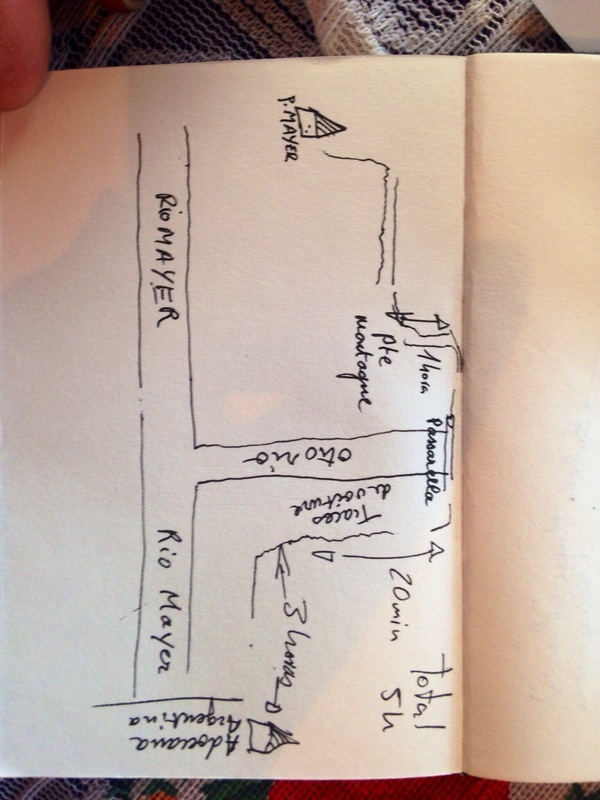 Check the photo’s below – someone drew me a ‘map’ of where these trails are. The problem with option 2 is that, even if I find that hiking trail and the track on the other side, I’ll still have well over 200km to cover from there until the first town that has food or water. 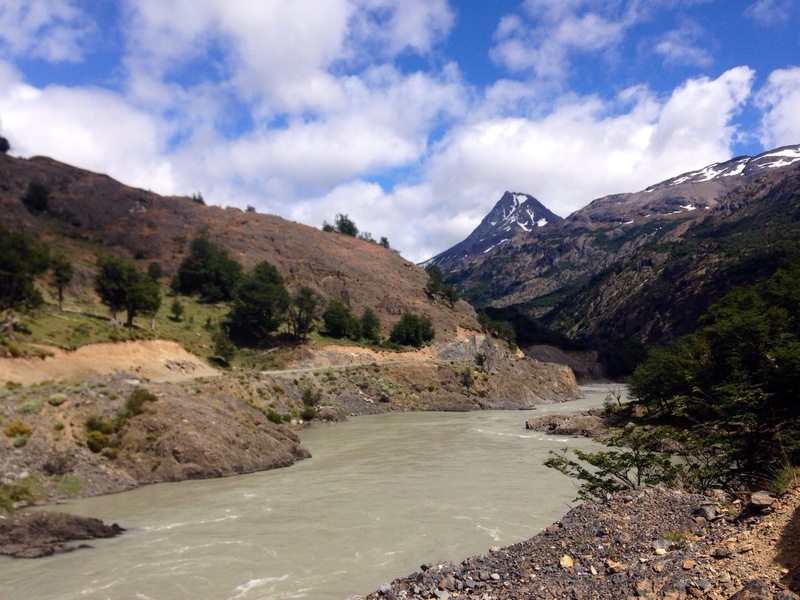 I’ll also be leaving the cold mountains behind and crossing the Pampas, which will be really hot and windy. Option 2 is clearly the more adventurous option and the obvious choice. However, first prize is to cross this lake to the South. I’ll stay a couple days and see if I can find another way across the lake – I’m sure there are entrepreneurial fisherman that are willing to negotiate a deal. Or the ferry might be repaired (although I hear now that the captain is out of town too, so this option is fading fast.) 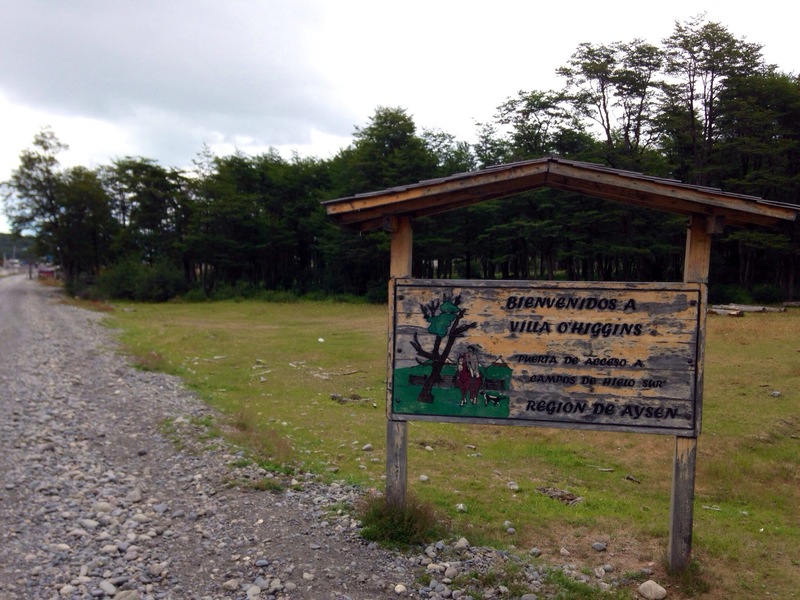 If I can’t cross the lake, I’ll head east through the pass and down to the pampas. I got into Puerto Rio Tranquilo last night around 19:30. 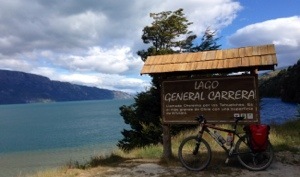 It’s a large town by Chilean standards – about 6 blocks long and 5 deep – on the shore of Chile’s largest lake, General Carrera. 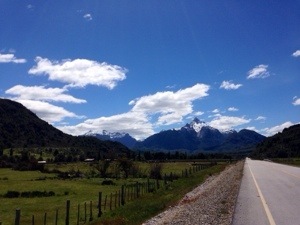 The last 5 days have taken me about 650km south from Chaiten, past the fishing village of Puyuhuapi, onto a tarred road in and out of the largest town in the region, Coyhaique, and then over some huge mountain passes and along never-ending valleys to where I am now. The mountains get higher and are covered in more snow as I go further south. 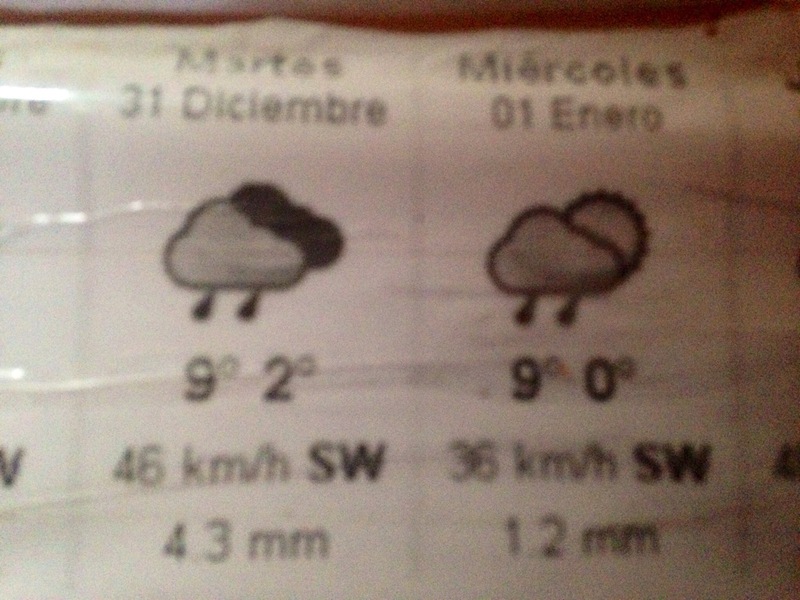 The wind is also much worse – its always windy. Food and accommodation are further apart down here. 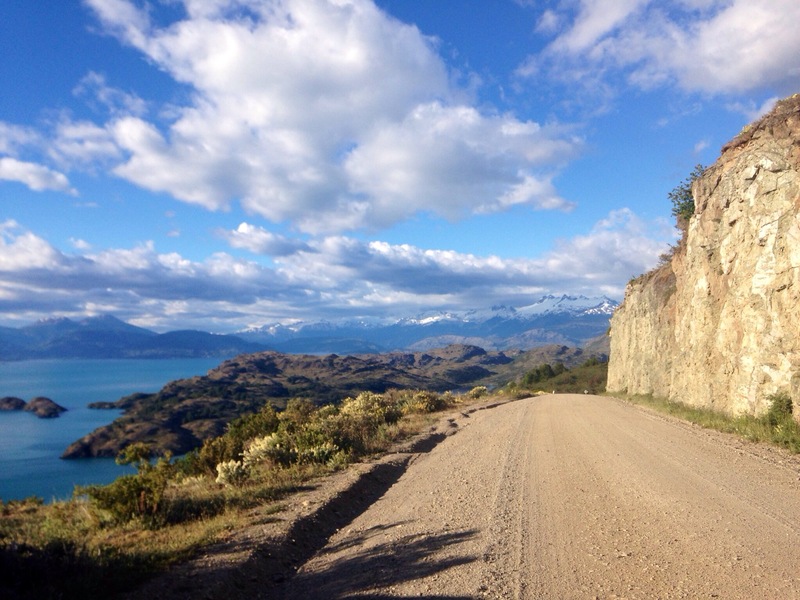 It’s perfect for the type of cycle-touring I enjoy – no traffic, big mountains and just the right amount of food and warm showers along the way! It’s R&R day today – for both bike & body. While eating as much as I can there are also a few repairs needed on my bike. The gears weren’t working well yesterday and it seemed that my rear hub was deteriorating. Today, with a clearer mind and a good night’s sleep I could diagnose the problem correctly – looks like the derailer dropout is threaded and bent. 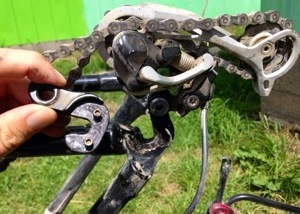 A much easier problem to solve than a rear hub – if I have I spare dropout. Fortunately, after my last cycling trip in Zambia (which ended single-speed), I don’t go anywhere without a spare dropout and jockey wheels. 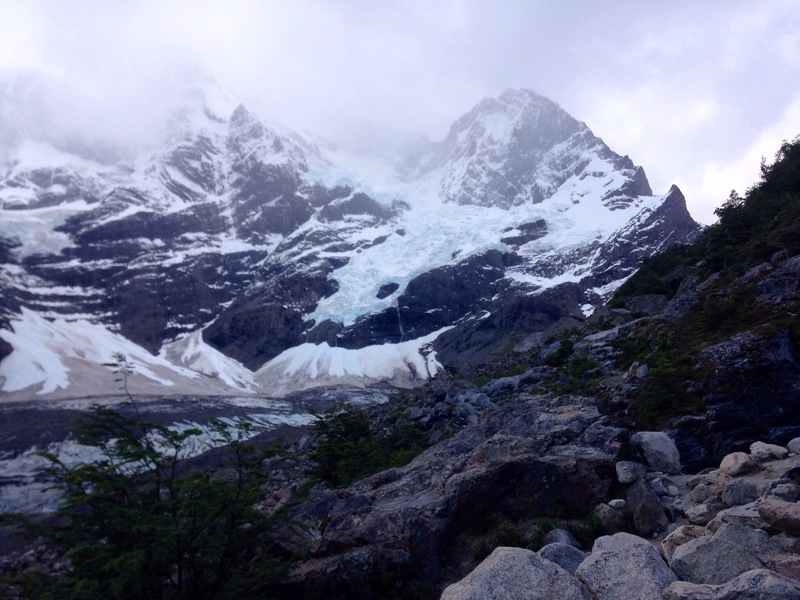 Tomorrow I’m planning a side-trip to hike up and into the Exploradores Glacier. 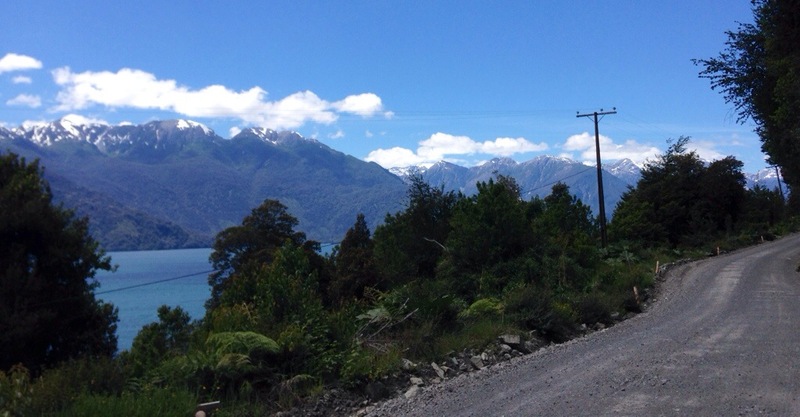 Then there’s about 3 days riding to the end of the road at Villa O’Higgins and the ferry crossing into Argentina. Today i saw Aconcagua. 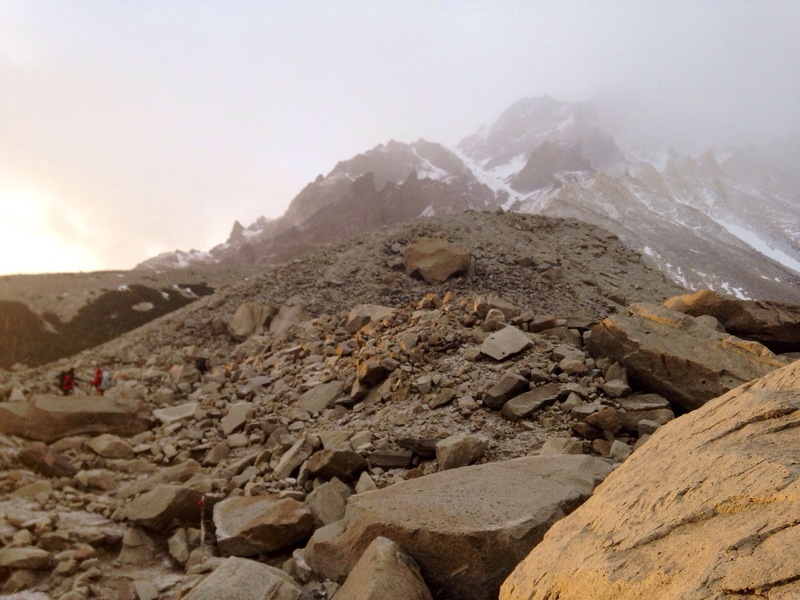 It’s the highest mountain on earth outside of the Himalayas – almost 7000m – and I’ve wanted to climb it for some time. 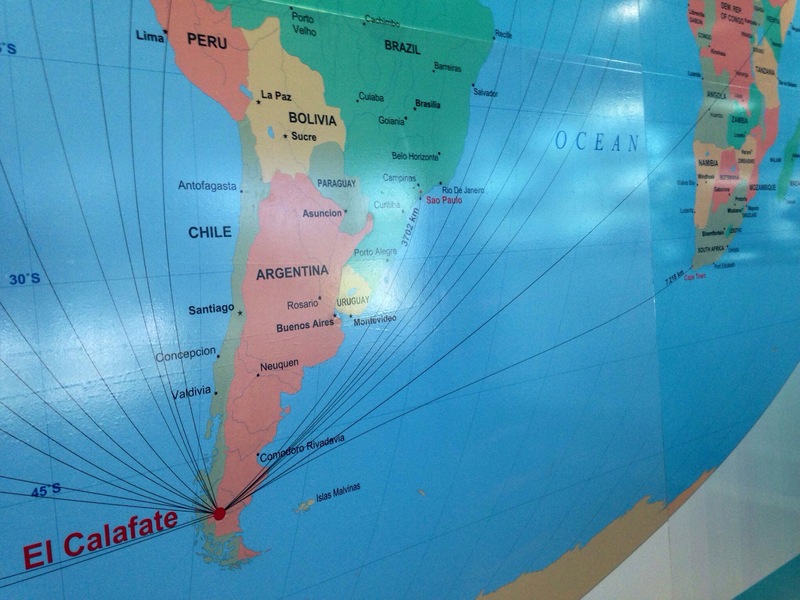 The flight from Buenos Aires to Santiago this morning crossed the Andes not far Aconcagua. 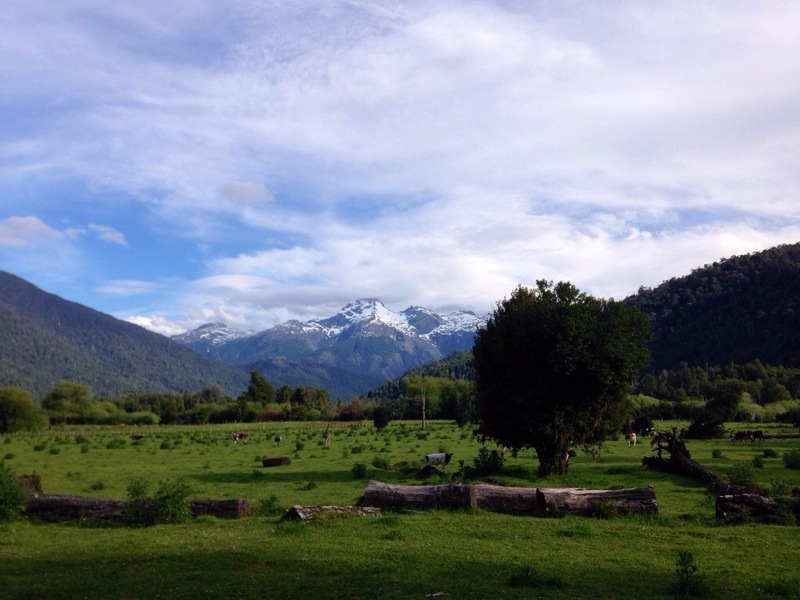 The Himalayas are snowed over and can’t be climbed during the few months of the year that the Andes can be summited. So anyone standing on top of Aconcagua can claim to be the highest person on earth at that time. That’s cool! The flight is a short 2 hour hop from the east to the west coast of South America. Most of the flight is over Argentina, which is flat and uninspiring between Buenos Aires and the Andes. During the last half hour of the flight the Andes rise up from the flatness, top out on snow-capped peaks right underneath the wings and then drop spectacularly back to the thin strip of habitable land on the other side – Chile. 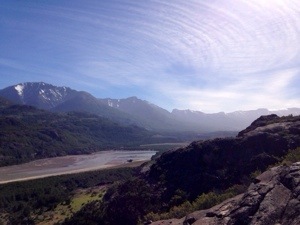 As one goes south from Santiago the thin strip of land gets narrower as the Pacific and the Andes get closer to each other. 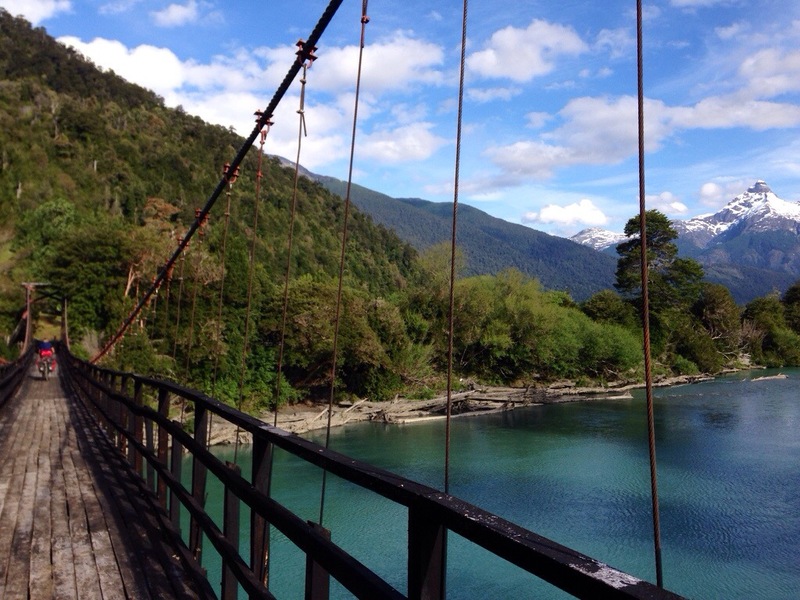 Puerto Montt seems to be the last space for a town before the mountains start to plunge into the sea. 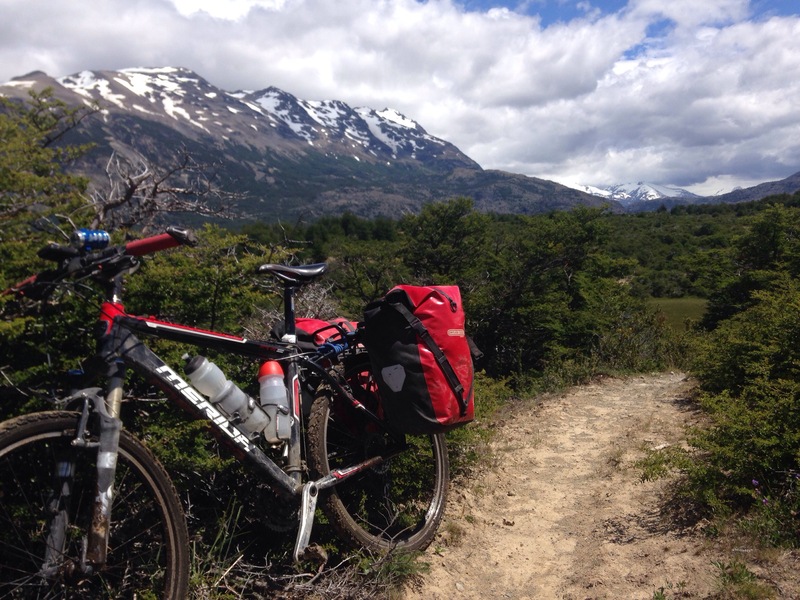 Here’s the next Adventure – a month of cycling in the Andes along the Carretera Austral from Chile to Argentina and then further south to Patagonia. 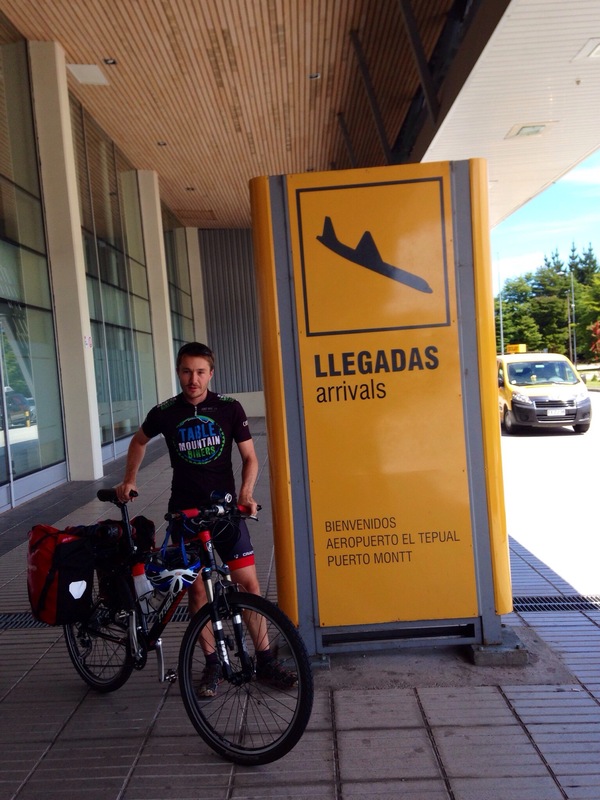 I’ve got a flight into Puerto Montt and out of El Calafate around a month later. There’s a hotel room booked for the one night I’ll be in Puerto Montt and a ferry the next day. 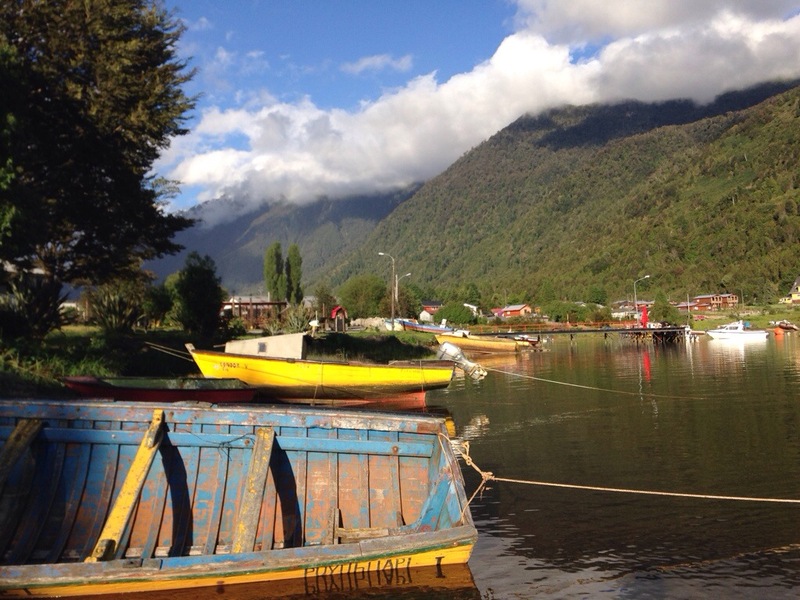 The ferry drops me deep in the Andes at a small town, and next to a large volcano, both called Chaiten. Cycling south from Chaiten will be remote with large stretches of uninhabited mountains connecting the few tiny villages along the way. There’s isn’t really much to plan for that part of the trip. I have the right gear (well, lets see!) and will need to make sure I stock up on enough food so I can cover those distances. 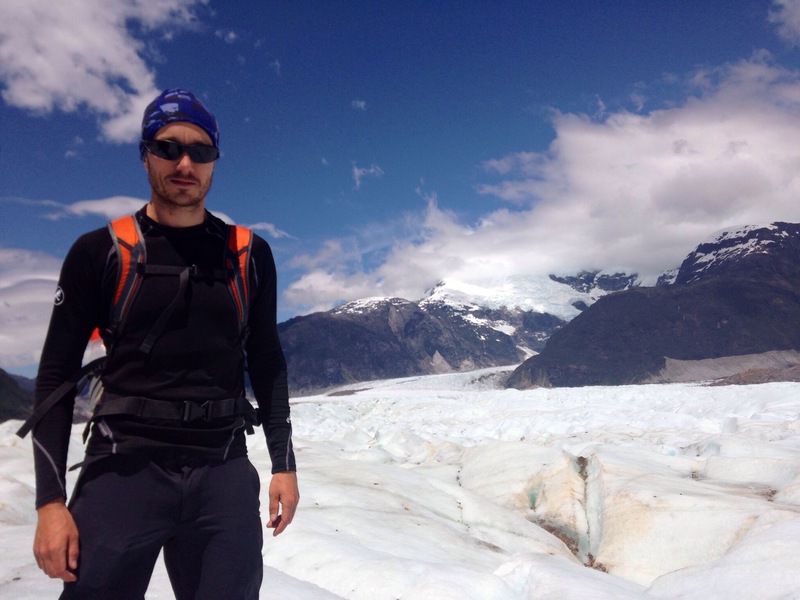 The rough idea is to end up at El Calafate in Argentina. What happens from there depends on how much time I have left before my flight home. 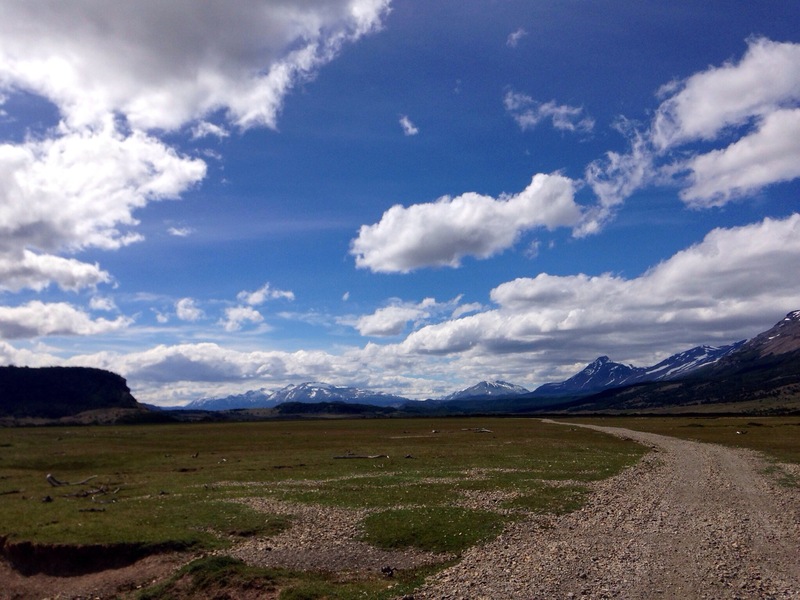 I could either hike the full circuit of Torres del Paine or push on to the bottom of the continent – ‘fin del mundo, principio de todo,’ Ushuaia! Or both. Whatever happens, there will be updates here whenever I find an internet connection. Watch this space.